I got this simple and cost effective recipe from something I got from the Money Saving Mom years and years ago. I shared it with my homeschool support group and I’m sharing it here today. 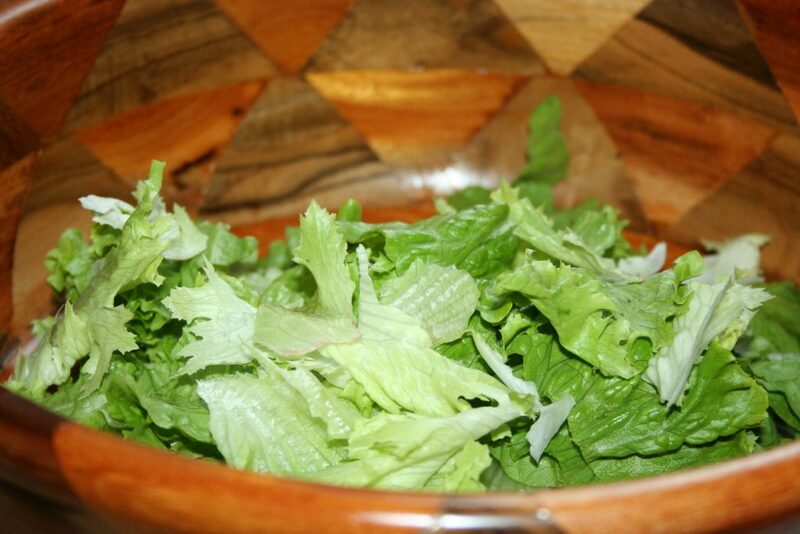 This recipe has stood the test of time in our house and is an easy one to throw together. 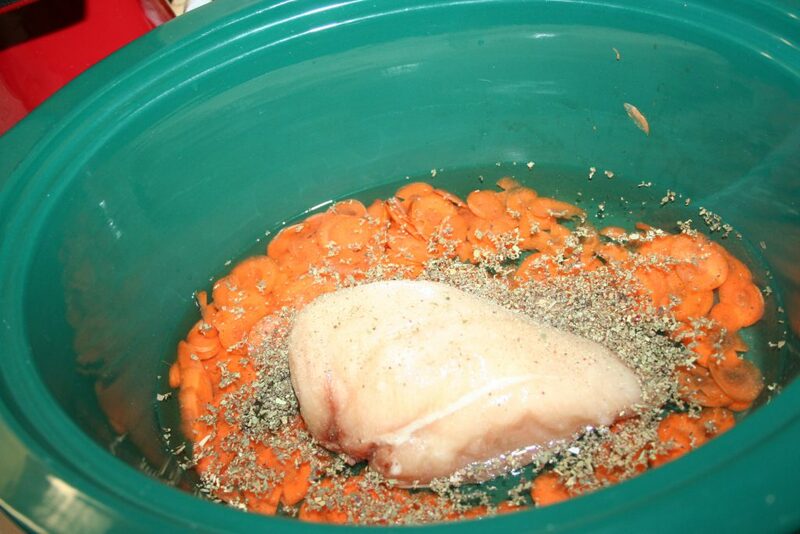 Start by putting enough chicken breast in the crockpot for your family. We are a family of four so one large chicken breast (one pound) works for us. Then add some carrot. 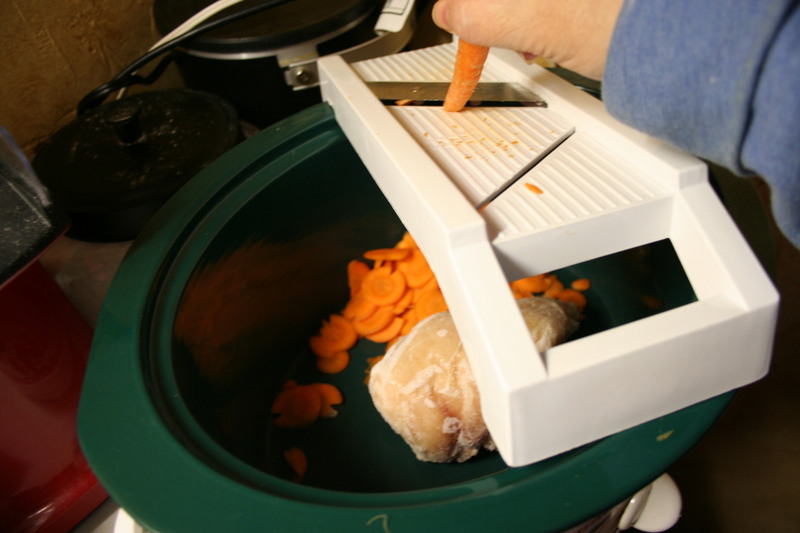 We like our carrot with zero crunch in the end, so I slice them up on my mandolin. 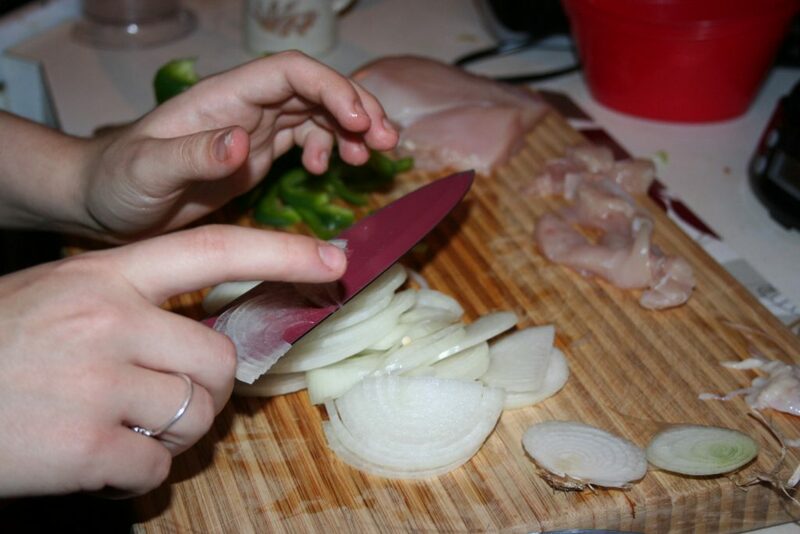 I forgot to add a dice onion this night, so I added onion powder later but generally, you’d add the onion now too. Next add about 3-6 cups of water or broth. I started with 3 cups this day. 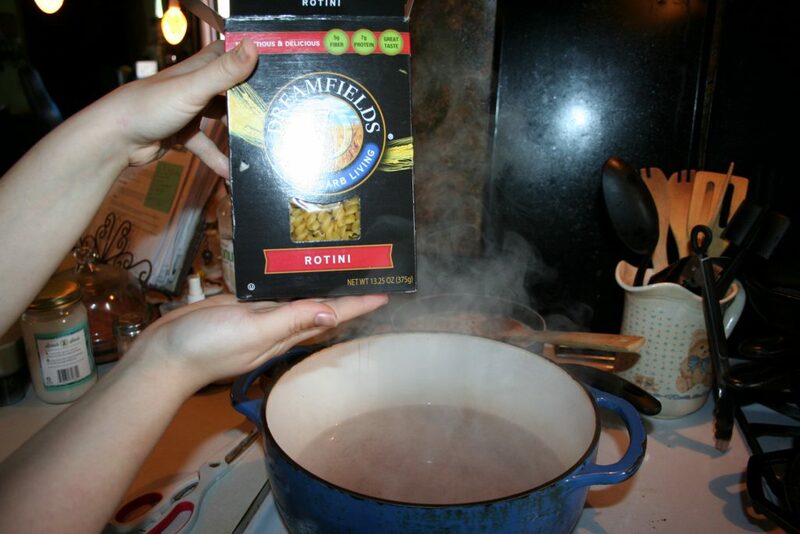 It’d been a while since I’d made this and forgot how much water/broth I usually use. Finally add seasonings: salt, pepper, and basil. 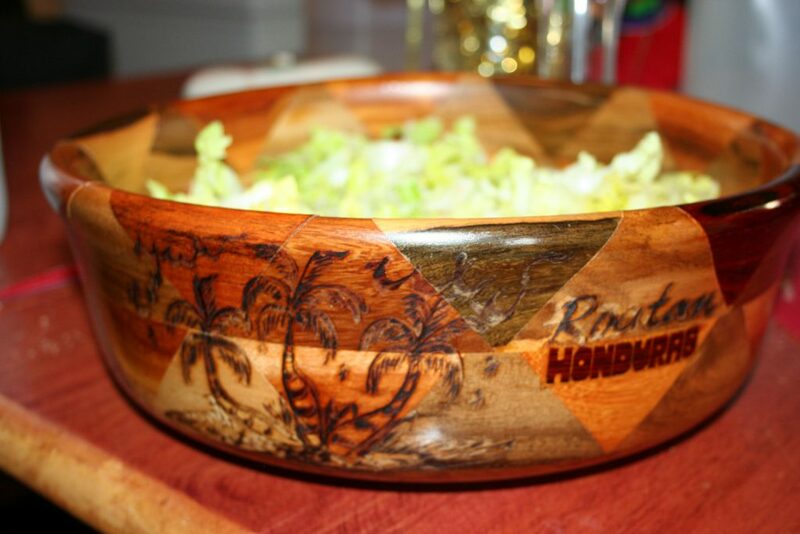 Add the lid and you’re ready to go. Cook on high for about 3 hours or so, until you can shred your chicken. I used a frozen breast and cooked it about 4 hours I think. When the chicken is done and shredded. I used my sprouted spelt drop biscuit dough and cut it thinner for the noodles. Add your noodles and cook for another 30-60 minutes, until the noodles are as done as you like them. 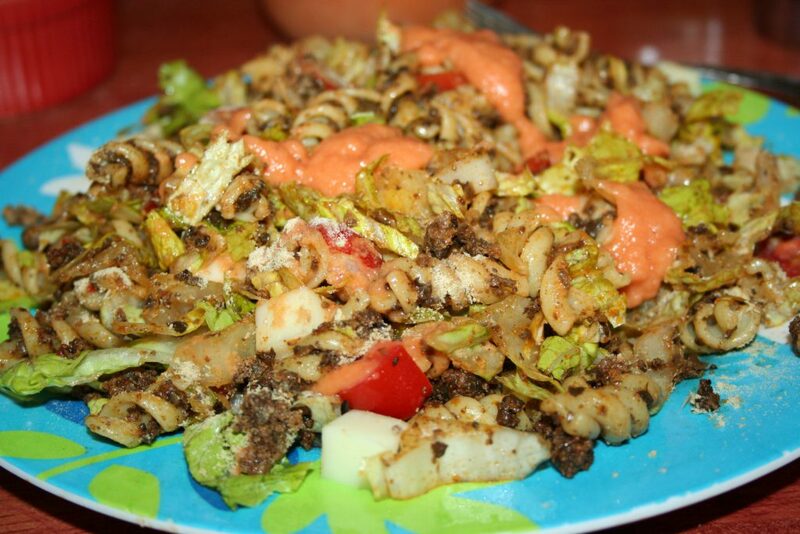 You can use Reemes frozen noodles, as that is what the original recipe called for. 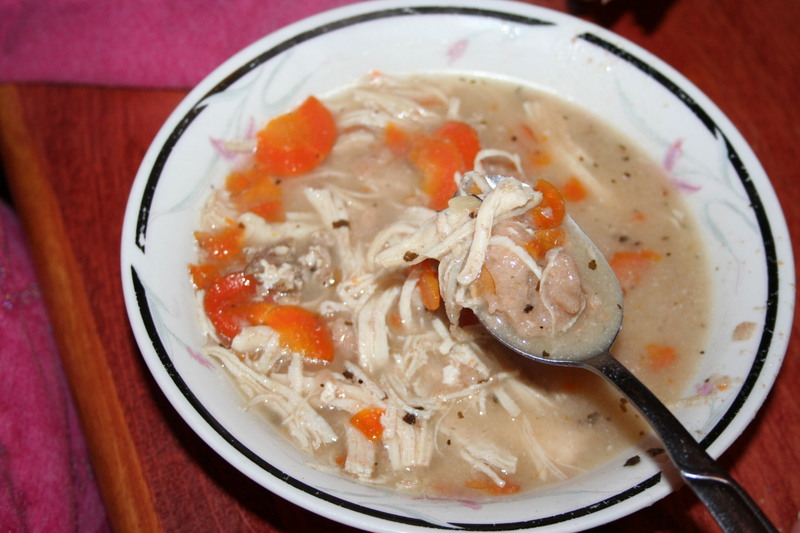 When we went to serve the dish, I realized that we wanted it more of a soup and quickly heated up a can of chicken broth (about 2 cups) and added it to the pot. 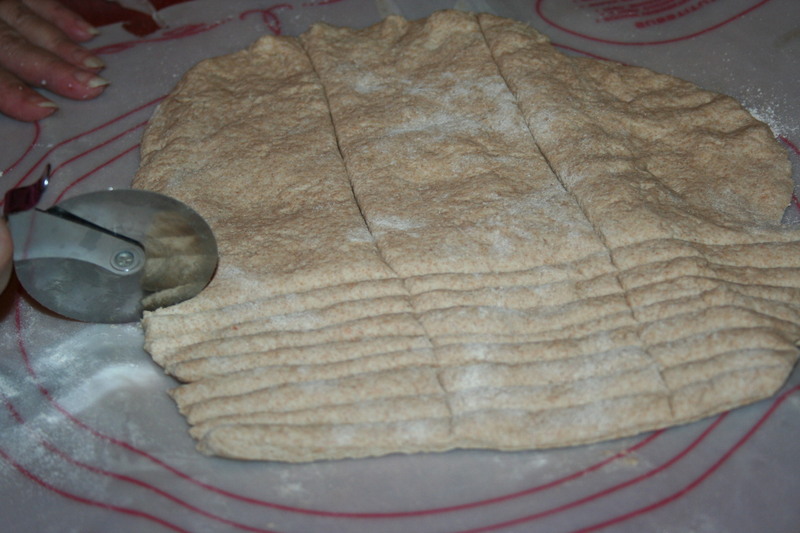 I made half a batch of my sprouted spelt drop biscuit dough and ended up only using about 2/3 of it in the soup. I sprinkled some garlic salt on the rest and baked in the oven for a few minutes. 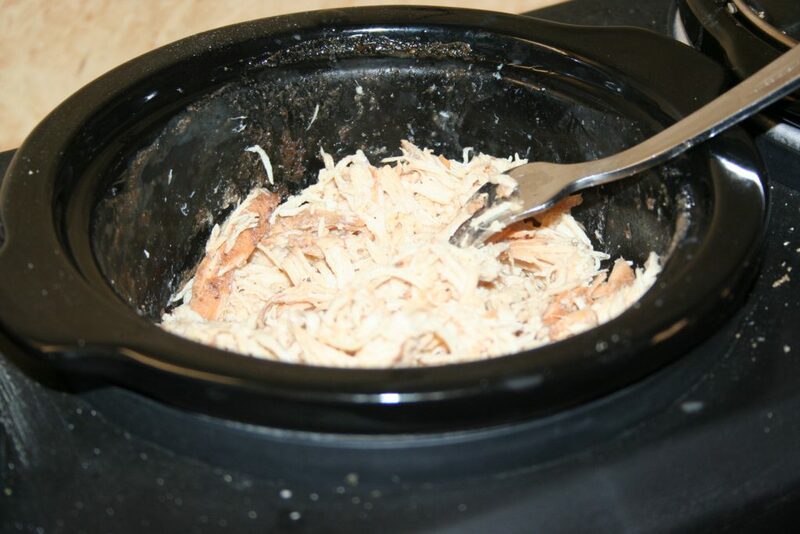 Place all ingredients in the crock pot except the noodles. 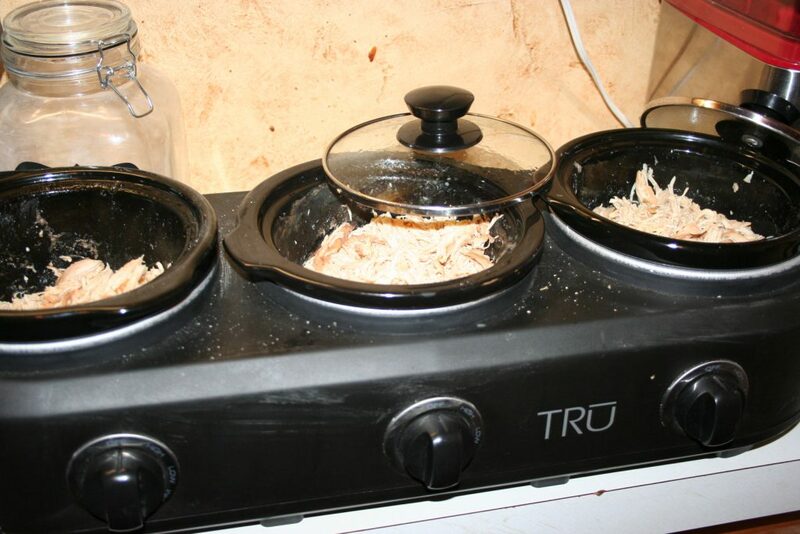 Cook on high for about 3-4 hours, until the chicken can be shredded easily. 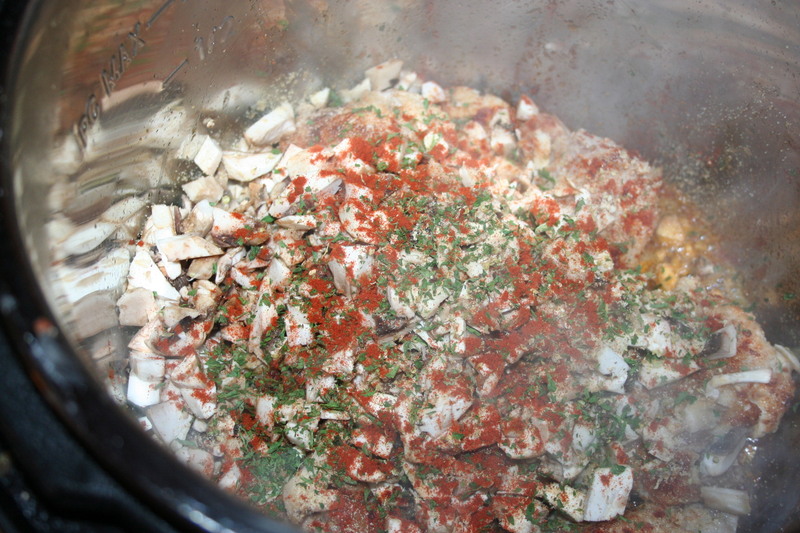 Add the noodles and cook for another 30-60 minutes on high, until noodles are done. Thighs were on sale for 79¢ a pound here and I bought around ten pounds of them. I bagged them in freezer bags in about six per bag, which is usually more than enough for this family of four adults. These are rather large thighs and, believe it or not, one is enough for me at dinner, with a couple sides. 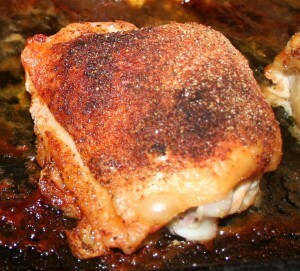 Today I thought I’d share some menu ideas for thighs. I have a freezer full of other meats that I’ve bought on sale, so I’m not stuck with just the thighs but thought I’d go ahead and share some different ideas, in case you find yourself needing to focus on one meat. The first one is super easy. Soup. 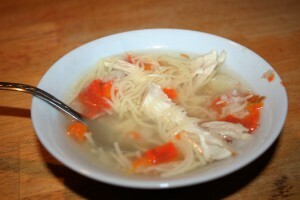 Chicken soup is inexpensive and the bone and skin add a great flavor to it. Baked. I place the thawed thighs on rimmed baking sheet, preferably on a silpat for easier cleaning, season, and cook. Serve with a couple side dishes: our go-to side dishes are green beans and salad. San Francisco Chicken. Normally this is made with chicken breast or pork chops but browning the thighs and then adding the sauce, covering and letting it cook about 20 minutes or until the thighs are done, should work nicely. 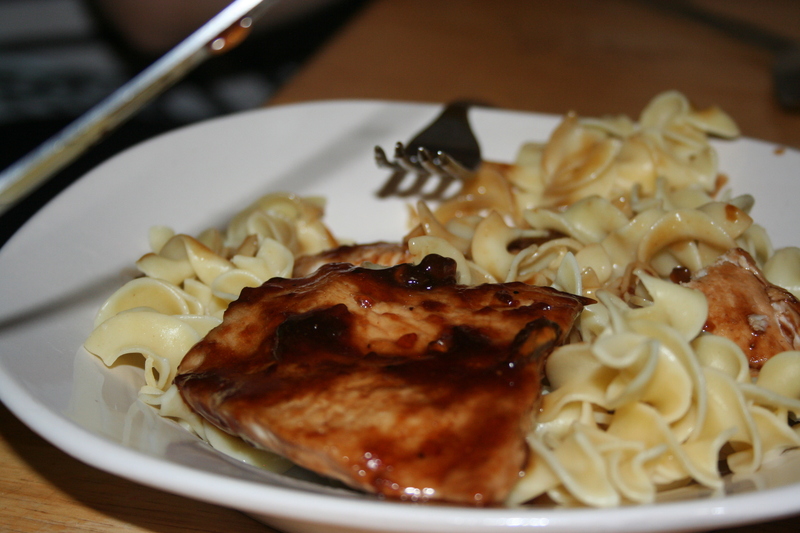 (The original recipe used this procedure with the thicker cut pork chops.) 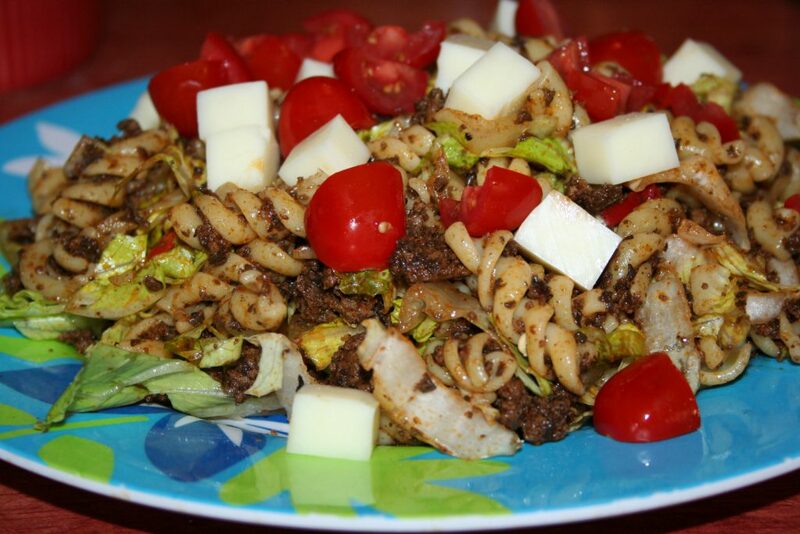 Serve with noodles (we use either Dreamfields or konjac root noodles) or thinly sliced cabbage and broccoli. Breaded and either fried on the stove top or in the oven. 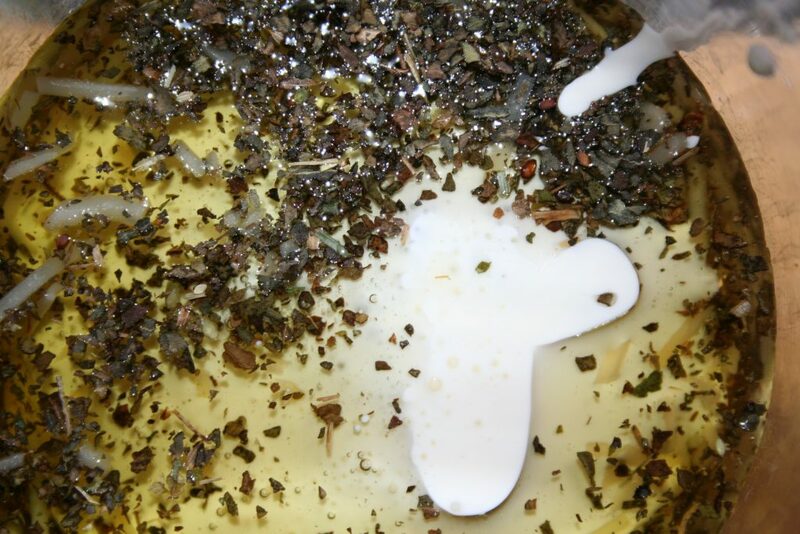 We just coat with a mixture of baking blend and Parmesan cheese after dipping in a beaten egg. 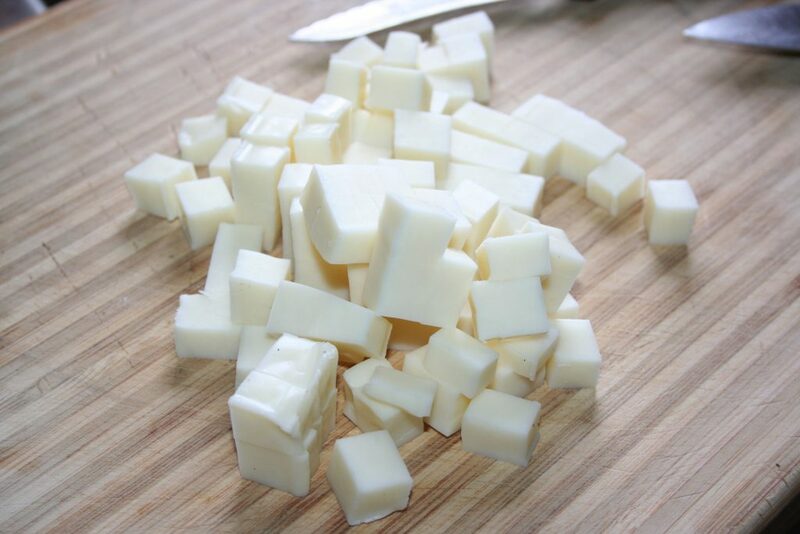 Alfredo. For this one I’d bake extra thighs earlier in the week and get the meat off the bone saving it for this day. When I make plannedovers, I have to hide the extra or my gang will eat it. 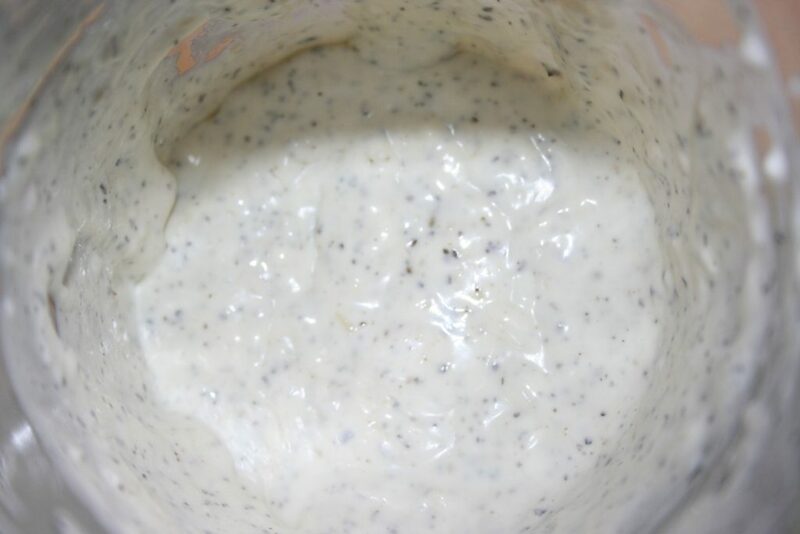 At any rate, this sauce can be a bit pricey and caloric, so you can just use a cream of chicken or cream of mushroom soup for the sauce. It’s good with cauliflower and or broccoli. 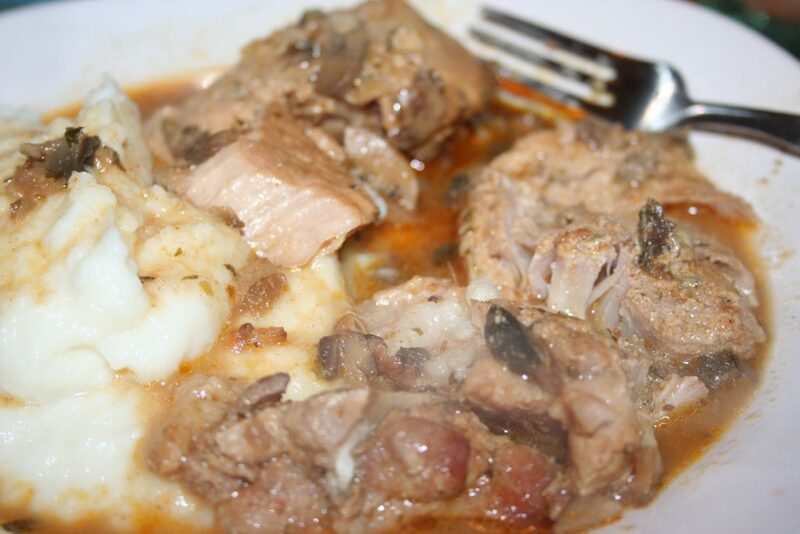 You could just thicken some almond milk up with some xanthan gum and add some onion powder and garlic powder to it for flavor or you could use the water from a can of mushrooms for part of the liquid and add the mushrooms if your family will eat them. 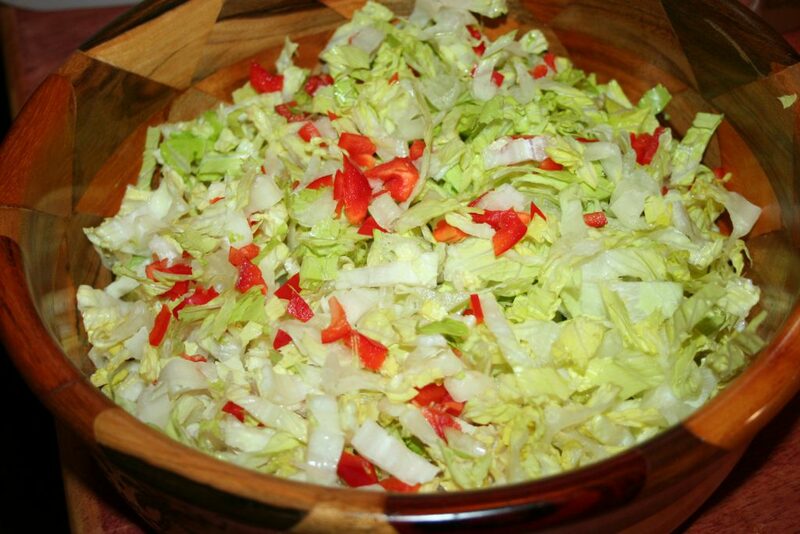 I’ve chopped them up finely to hide them from my kids when they were young. As they got older, I just tell them to pick them out and give them to me. For the last one, I’d make some like for number six but put it as a topping on pizza. If that isn’t an option, make Chicken Parmesan baking breaded chicken and when nearly done, add some tomato sauce (or spaghetti sauce or pizza sauce) and a little cheese to the top. Well, that’s my week long menu for using chicken thighs. 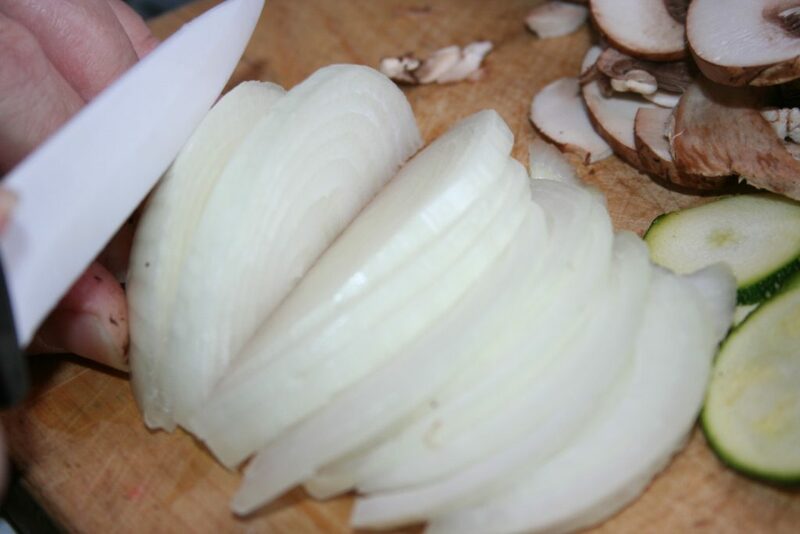 These links are all mine but have been taken from my many different ways of cooking throughout the years. If you have a particular one you would like me to make suggestions on how to conform it to a particular fuel source (fats or carbs or light on both counts), let me know and I’ll see what I can do. As my family has gone to the chiropractor, each one has been given a questionnaire to complete as part of the initial consultation. This questionnaire is quite lengthy but helps to determine your body type for the purpose of suggesting the food emphasis you should follow. As it turns out, all four of us are Thyroid Types or T-Type for short. Unfortunately the t-type diet is a low fat one with moderate carbs, very similar to the THM energizing meals. At first glance I was very saddened by this diet recommendation but realized that it was quite similar to the Stubborn Loser’s Menu on Trim Healthy Mama (THM) where I’d lost nine pounds in three weeks. The other evening we had country style pork ribs and Tiffany seasoned them really well. I’ll write it down next time and take pictures to share with you. I fixed chicken breast seasoned the same way for Michael. There was some of his leftover, so Tiffany and I added that to our salad the next day and it really made a difference in our enjoyment of said salad. Aldi had boneless, skinless, chicken breast on sale for $1.49 a pound last week, so I got two packages of it. 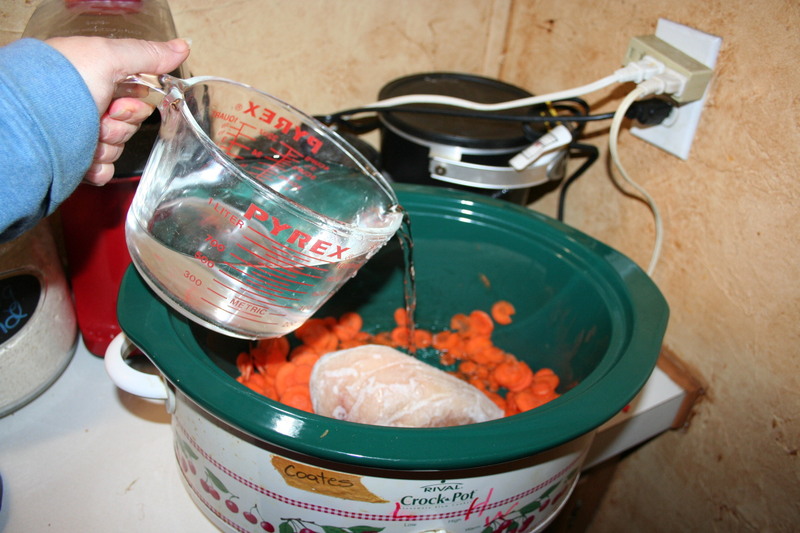 We bagged each large breast of one five pound package into a quart size freezer back and then froze them for use later. The other six pound package we cooked up for salads. 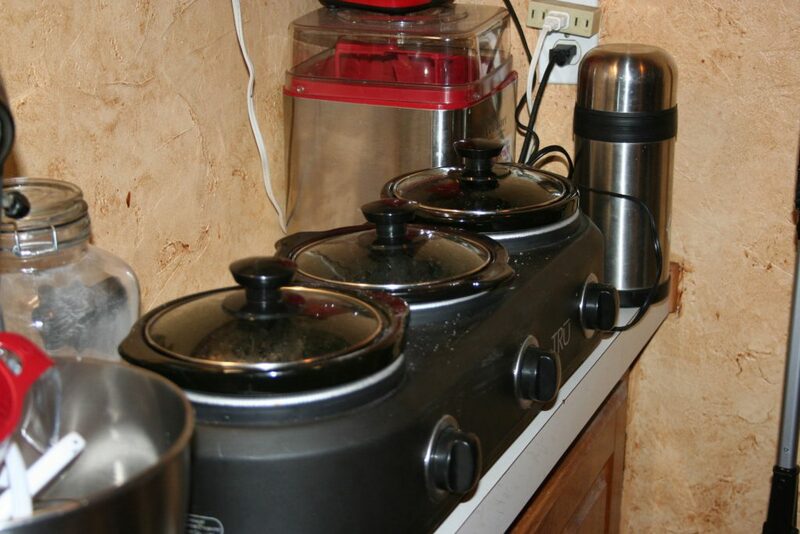 I have this three crock cooker and placed two large breasts in each crock. We seasoned one with the yummy bar-b-que seasoning from the other night, one with onion powder, garlic powder, salt, pepper, and balsamic vinegar, and the final one with soy sauce, Sukrin gold (which is a brown sugar substitute), salt, and pepper. 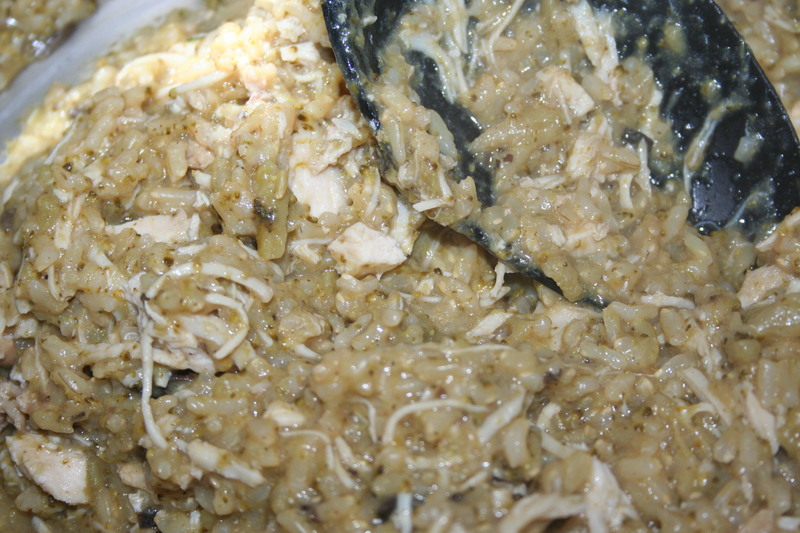 When it was cooked, I shredded it and stirred it around into all the juices in the pots. I used the potato masher in a twisting motion to break it up into chunks/shreds and finished it off with forks. Once it cooled, I bagged it up and froze most of it. 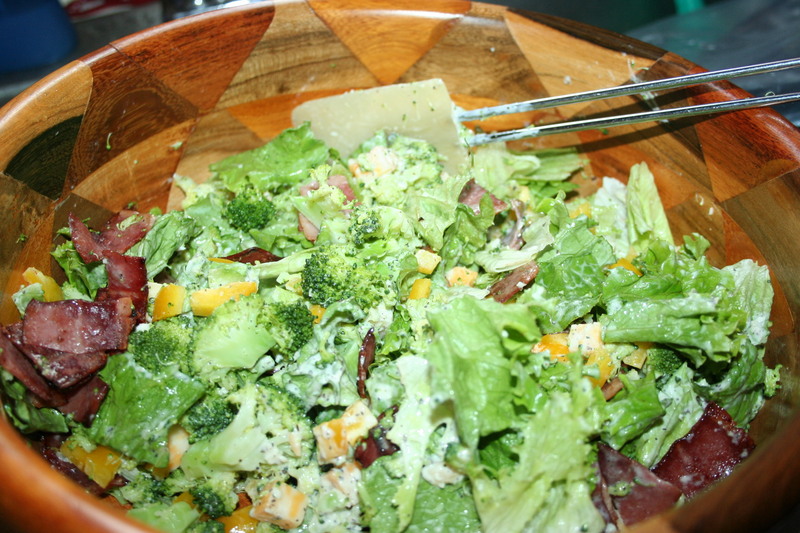 I kept half of the bbq one out for our salads the next couple of days, since I know that one is Tiff’s favorite. 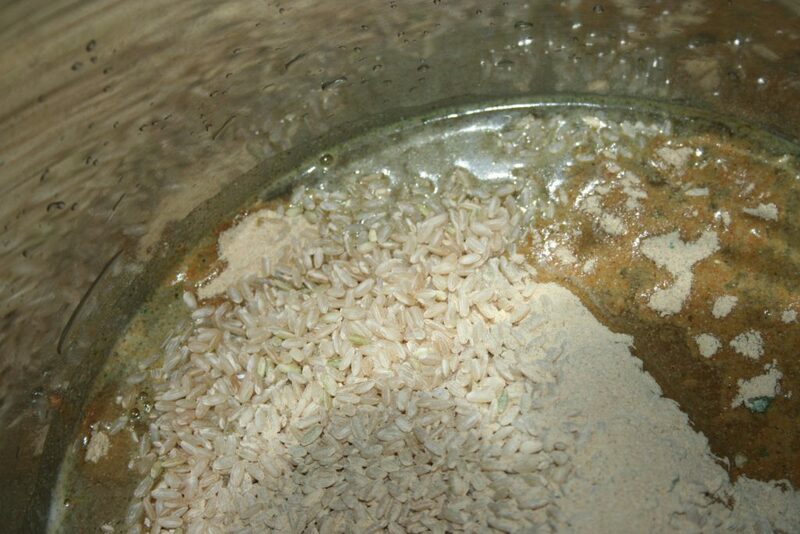 We’ll probably have to add more seasoning next time because it wasn’t very strong but better to need to add more than to have it too seasoned. I hope this gives you an idea of how to prep some chicken and make your lunches a bit easier and more flavorful. 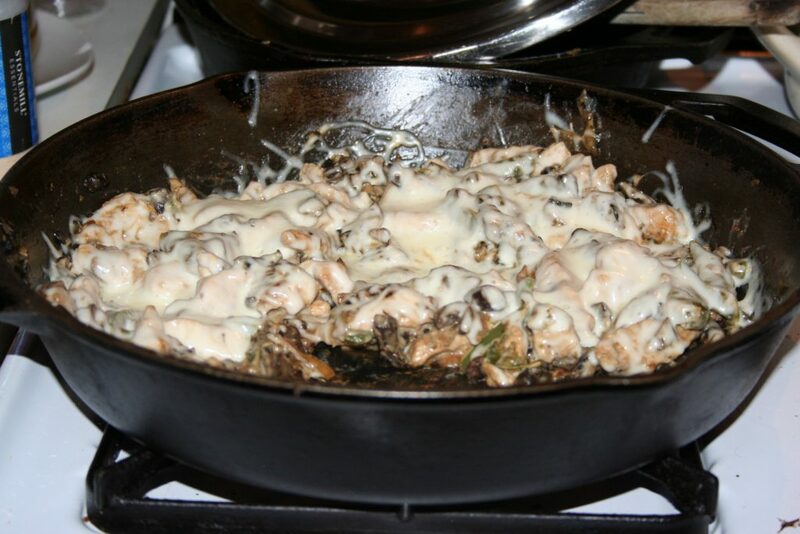 Creamy, cheesy chicken cooked with onions, mushrooms, and bell peppers. When I was in my early twenties, I worked at a pizza and sub shop. I love pizza but when I worked there I realized that I also loved sub sandwiches. Specifically Philly cheese steak sandwiches. Oh, don’t get me wrong, I also really liked Italian hoagies and hot ham and cheese subs too. Most every time I worked, instead of getting a small pan pizza, I got a Philly Cheese Steak. 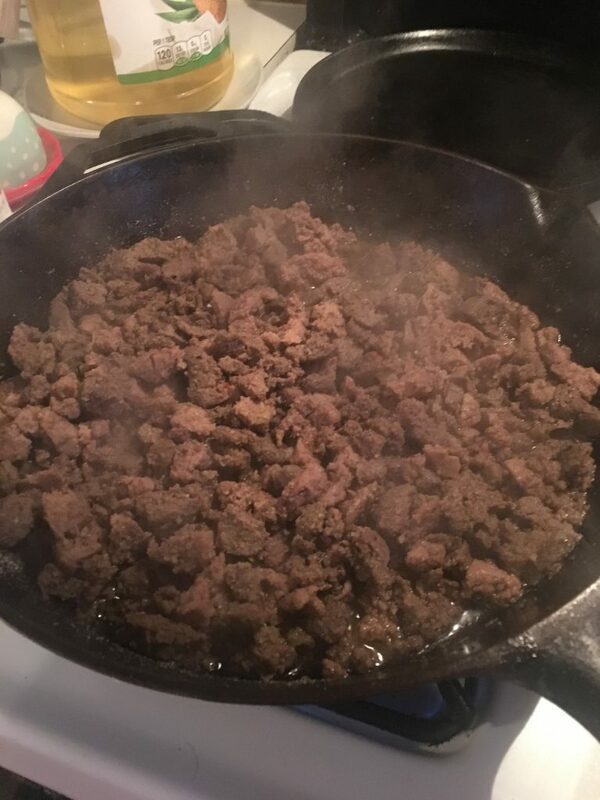 Early in my marriage, I found Steak-Umm steaks and figured out how to make them at home. Yummo! Well, Michael cannot have steak currently, so I decided that I’d try to make this over with chicken. We all loved it. Without further adieu, here’s how to do it. 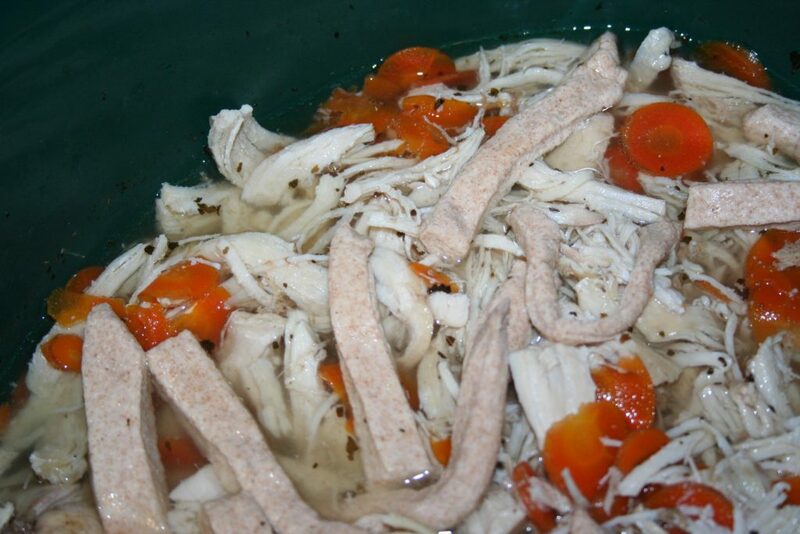 Slice the veggies and chicken into thin strips. 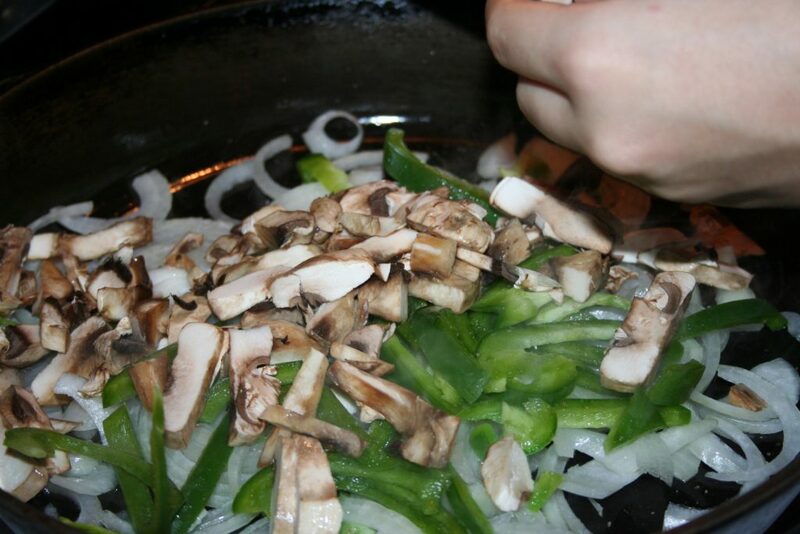 Sauté the veggies until nearly done to your liking. 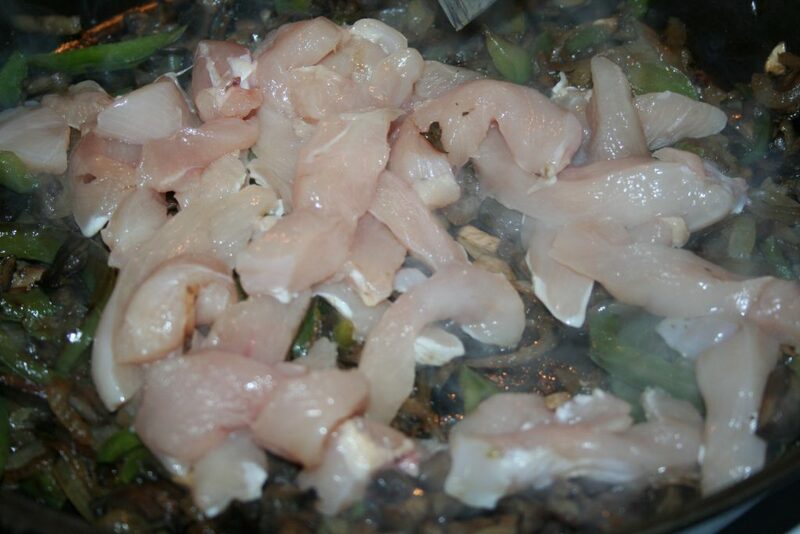 When chicken is cooked, about 5 minutes or so, depending on how big or small you cut your chicken pieces. 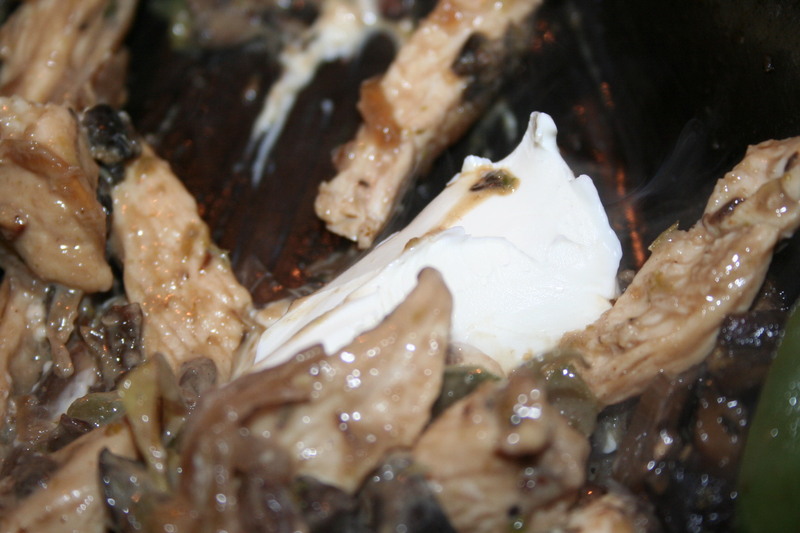 Add the cream cheese (or Greek cream cheese) and stir to combine until cream cheese is melted. 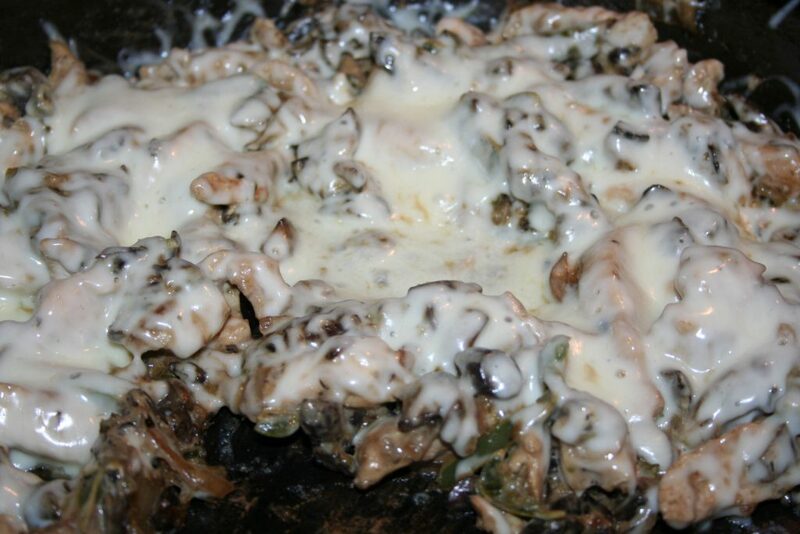 When it is melted, it is ready to serve. I heated some Swiss bread to serve this on. We like green fries (roasted frozen fancy green beans) with ours. 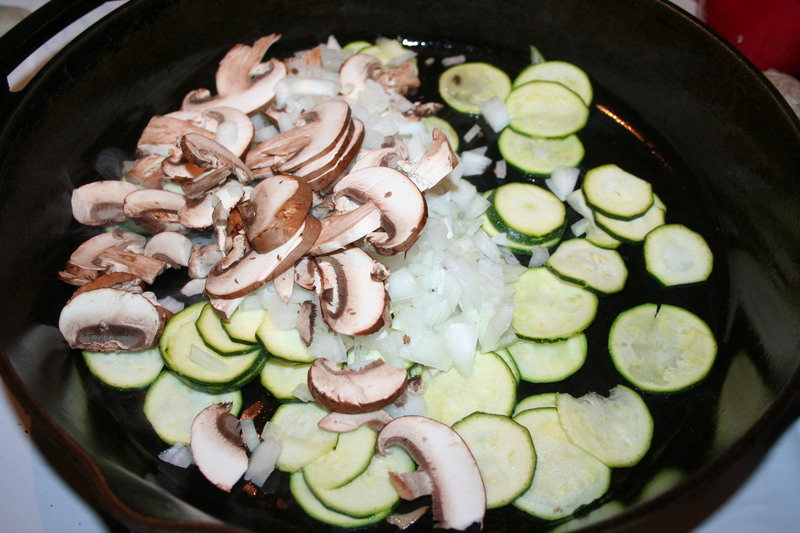 Slice veggies and sauté in a bit of oil. Add sliced chicken when veggies are nearly cooked as desired. add cream cheese, mix in and allow it to melt. I had some pork in the freezer that I wanted to use for dinner one night. 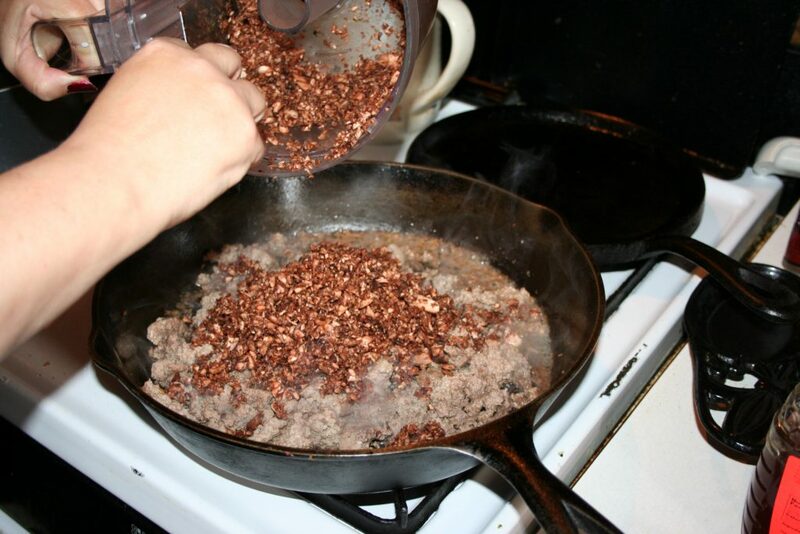 I searched online and found a few interesting recipes. 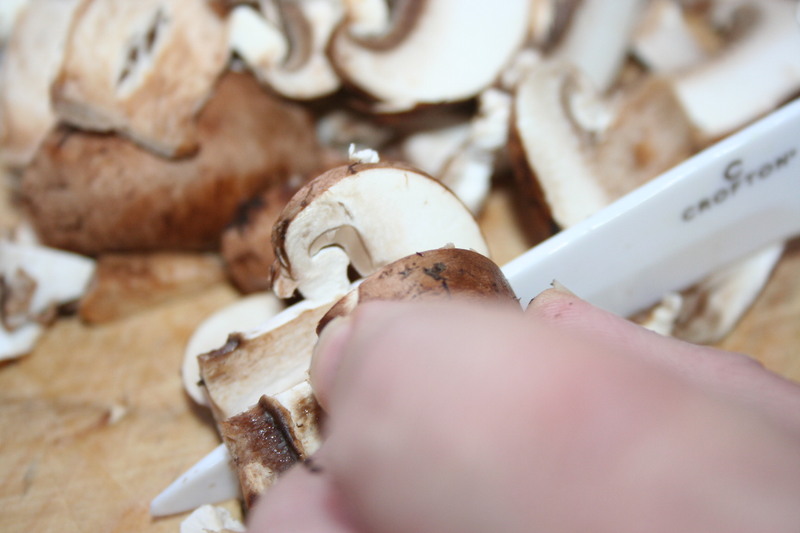 But what got my attention was this cream of mushroom soup DIY recipe that was already THM compliant. 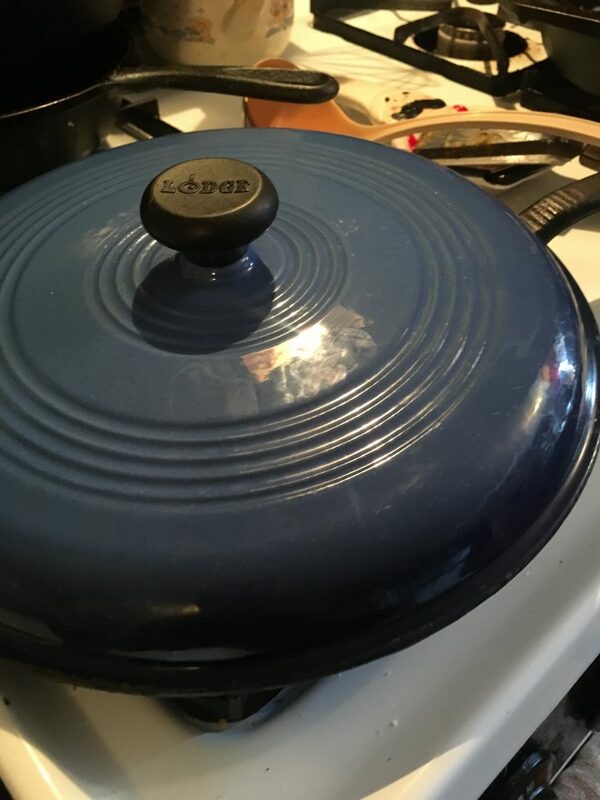 Her choice was to use her instant pot as a slow cooker and I wanted to use it to get it done quickly and as hands free as possible. I wasn’t really interested in her ranch flavor either. So I kept searching and found this keto recipe for cooking pork chops. I shied away from this recipe because it had heavy whipping cream and I need to back off the dairy and lots of fat for a while. 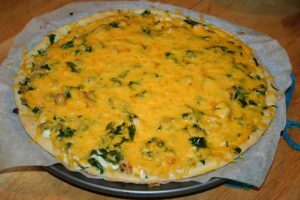 I decided to mesh the two recipes into my own making and share it here with you today. Warning: Start an hour before you need to eat, so not exactly INSTANT. 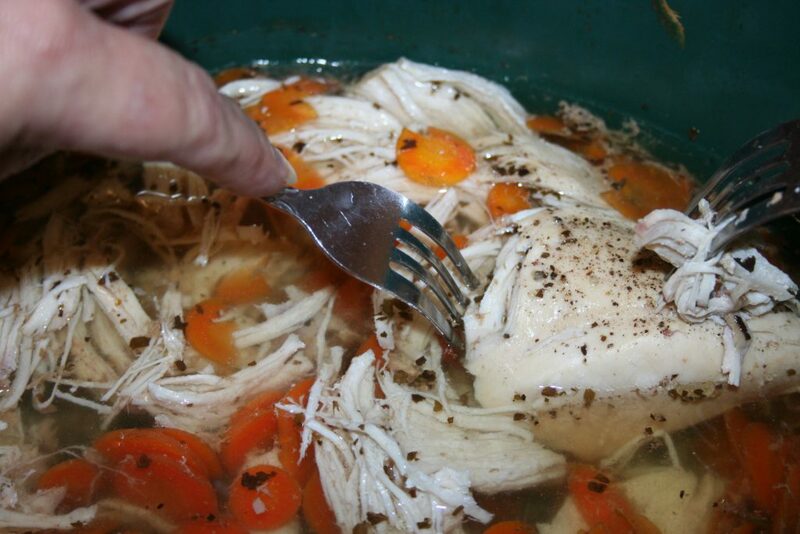 I do this recipe with both chicken and pork. 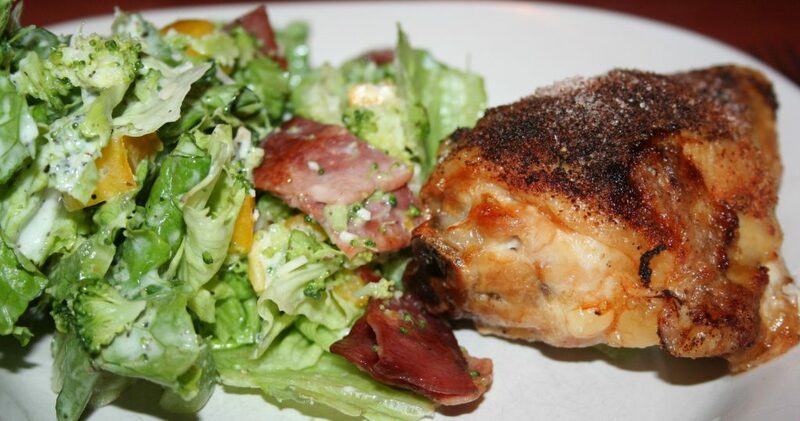 I used some bone-in pork sirloin steaks, I’ve used chicken thighs and boneless chicken breast. All turn out well. 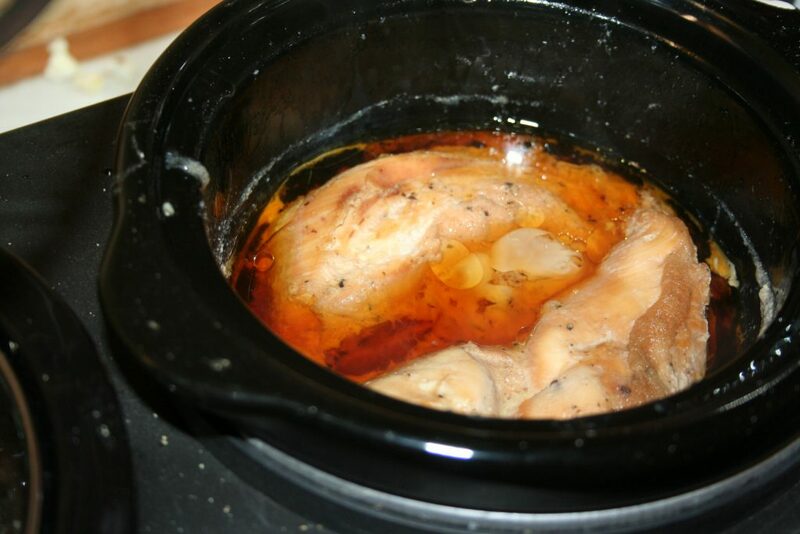 Start by turning the instant pot on Saute and add a little bit of oil so the chops don’t stick as you brown them. Season the meat on both sides. 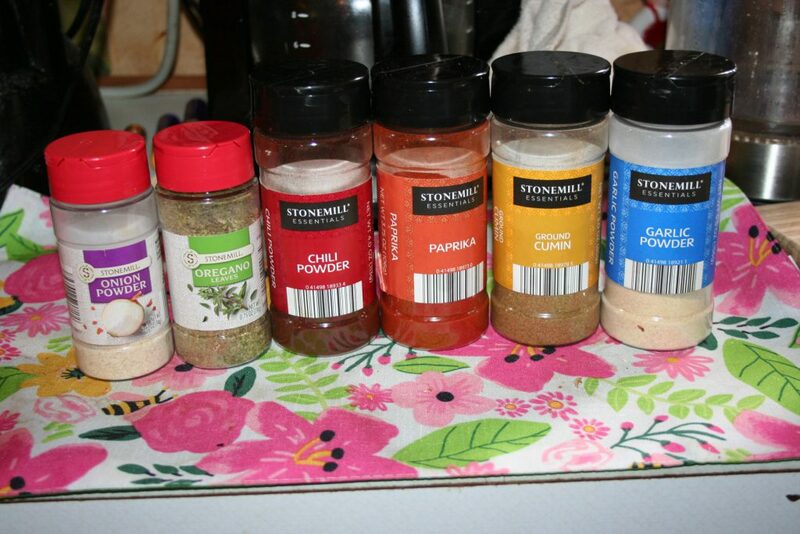 Now you could be all professional like and mix the seasonings in a bowl and then rub them on the meat but I’ll be honest here, I just sprinkle on the salt, pepper, onion powder, garlic powder, and paprika. I try to season one side, then put the meat, seasoned side down onto the pan or in the instant pot then season the other side while the first side is browning. 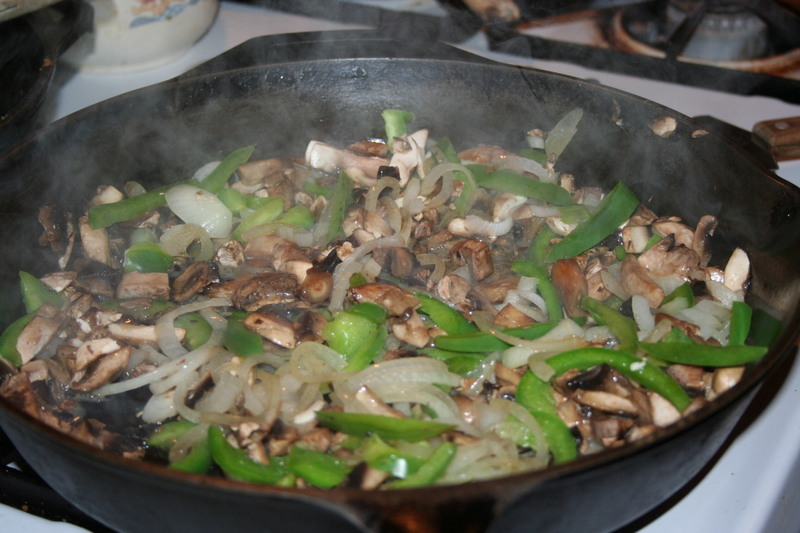 While that is browning, dice or slice up the mushrooms and onions. Now, I’m going to be honest with you, you should probably take the meat out and put in the veggies but I didn’t do that. I just dumped the chopped onions and mushrooms on top of my meat. 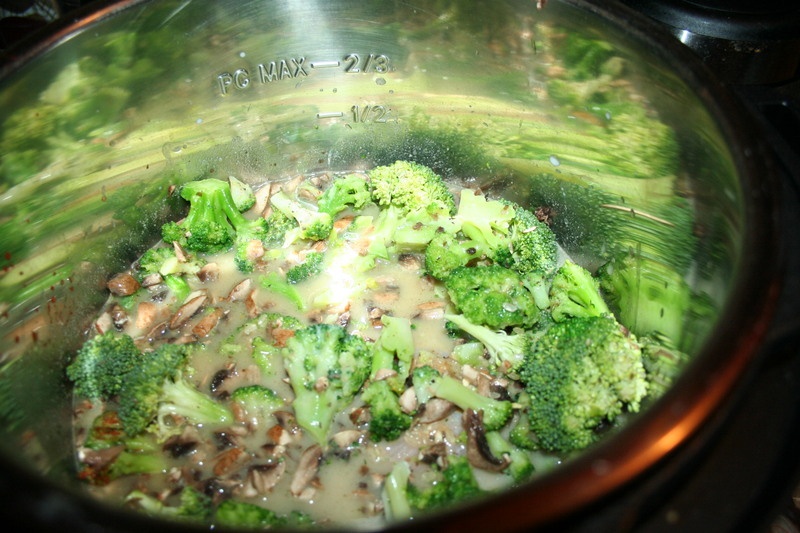 Then I sprinkled in the rest of the seasonings and added the broth and almond milk. Pressure cook for 25 minutes. 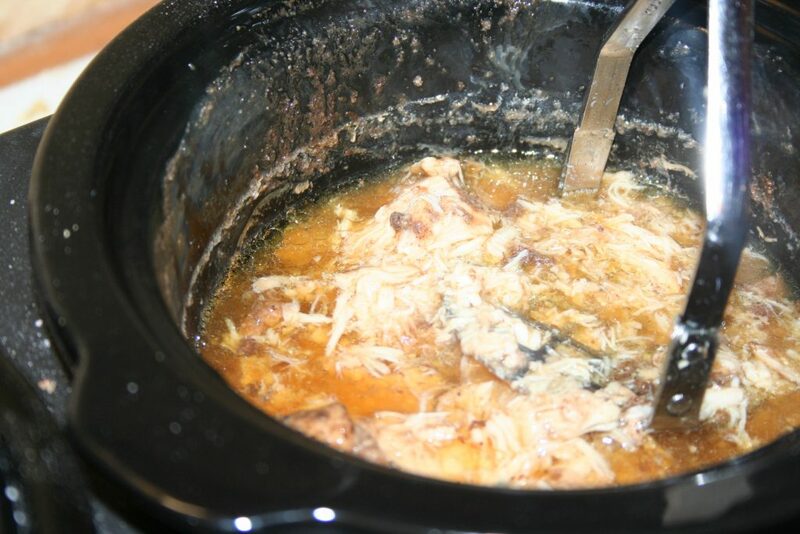 Let it warm for 10 minutes and then release the pressure on the instant pot. Now here is where I goofed this time around. I was so hungry and ready to eat that I forgot to thicken the gravy. Push the meat to the side. Press the saute button and once the broth in the pot is starting to simmer I shake in some gluccie (gluccomannon) and sprinkle in about a half tablespoon of baking blend. Let it simmer for a few minutes and then add the meat back in or serve separately, your choice. 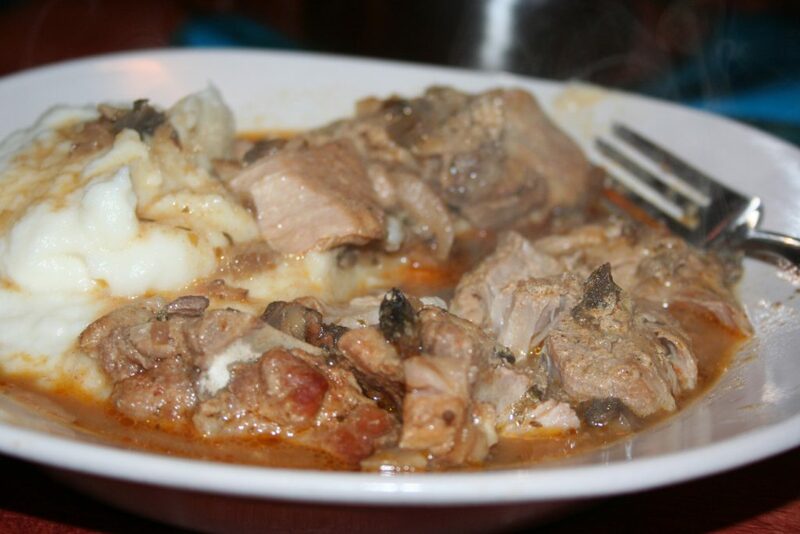 We serve this with a big head of cauliflower, mashed (caulitaters) and three cans of fried green beans. 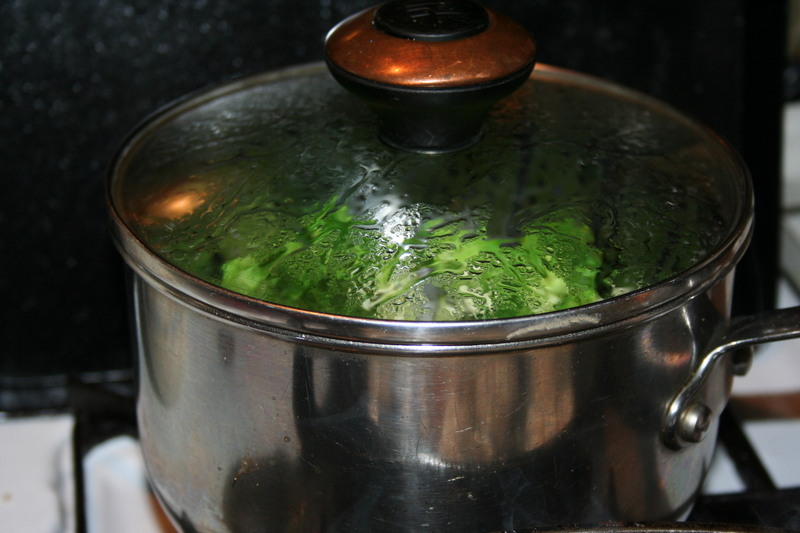 Heat the oil in instant pot on saute. Brown the seasoned side of the meat and season the other side. 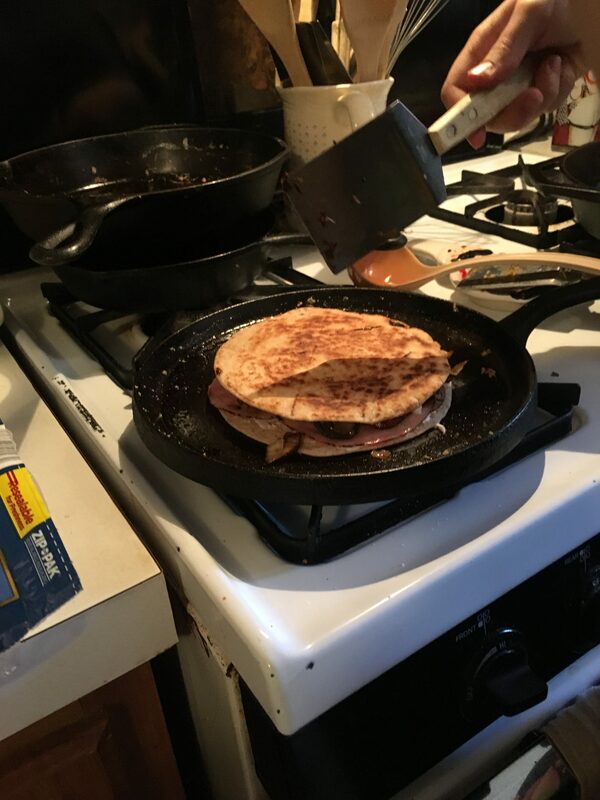 When browned, flip and brown other side. Add remaining ingredients except for glucomannan/xanthan gum and optional baking blend. Pressure cook for 25 minutes with vent closed. When it beeps, let it sit for another 10 minutes if you can wait. 😉 Then quick release. 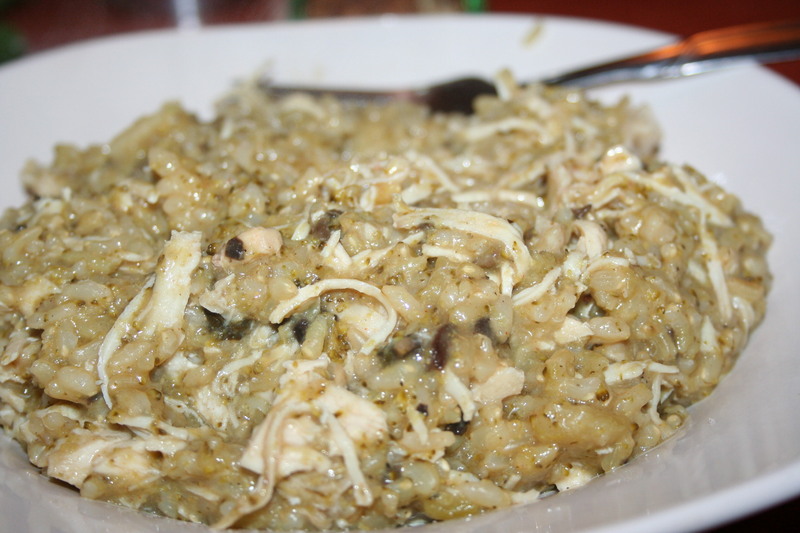 Add glucomannan and optional baking blend as you stir and it simmers. It will thicken up a bit as it sits. I hope this recipe is helpful to you. We enjoy it. 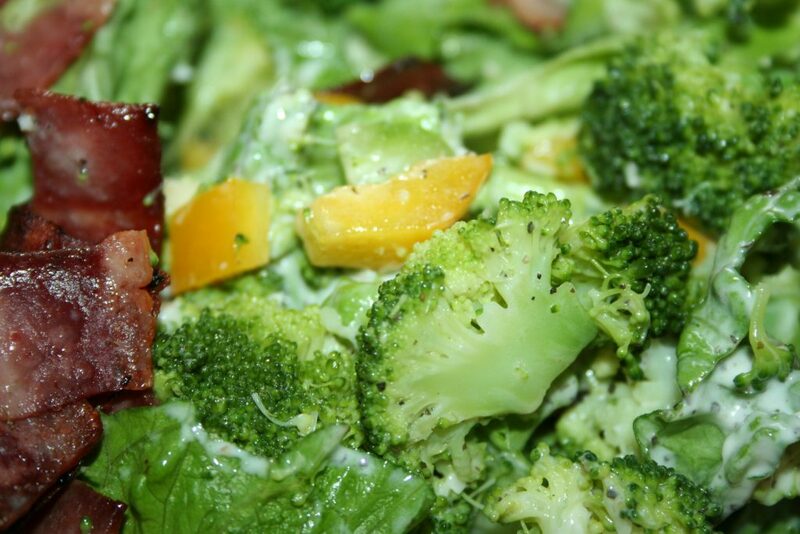 Here is another delicious way to get in those veggies. 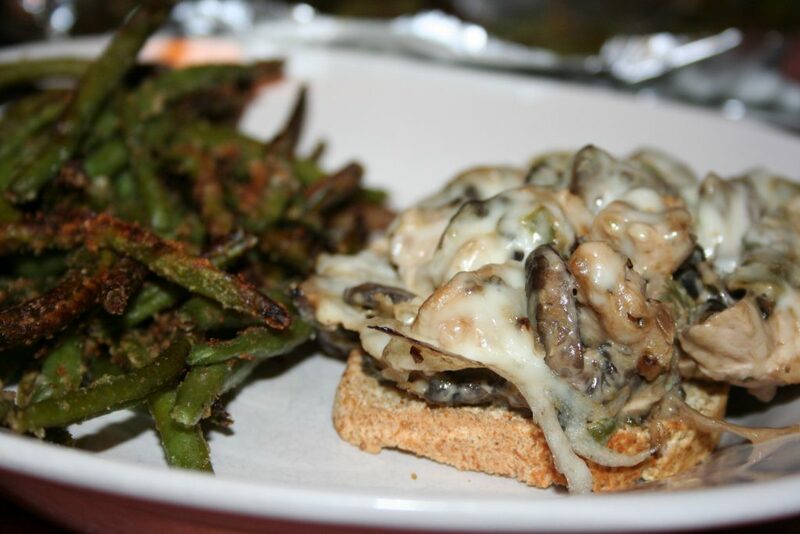 Use whatever veggies you prefer or have on hand. As I mentioned last week, I’ve been on a quest to get more veggies into my meals. I don’t really love veggies yet but I’m making every effort to eat them anyway and eat them in a yummy way. 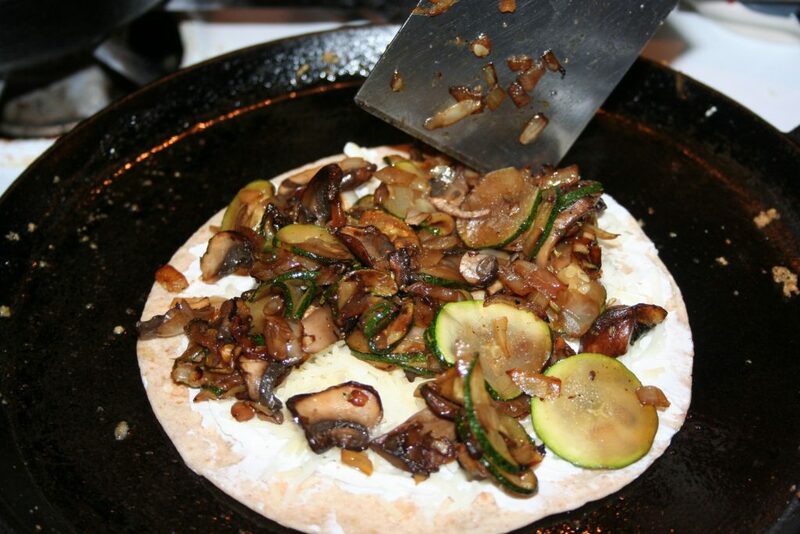 Today I’m sharing a veggie quesadilla. Now I know that quesadillas mean cheese. 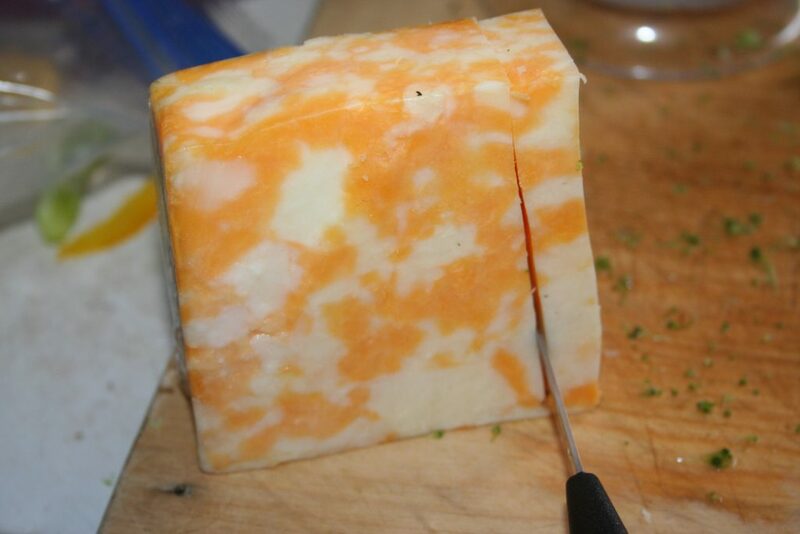 I love cheese but I have loved it a bit too much. I’m working on lessening it in my diet. 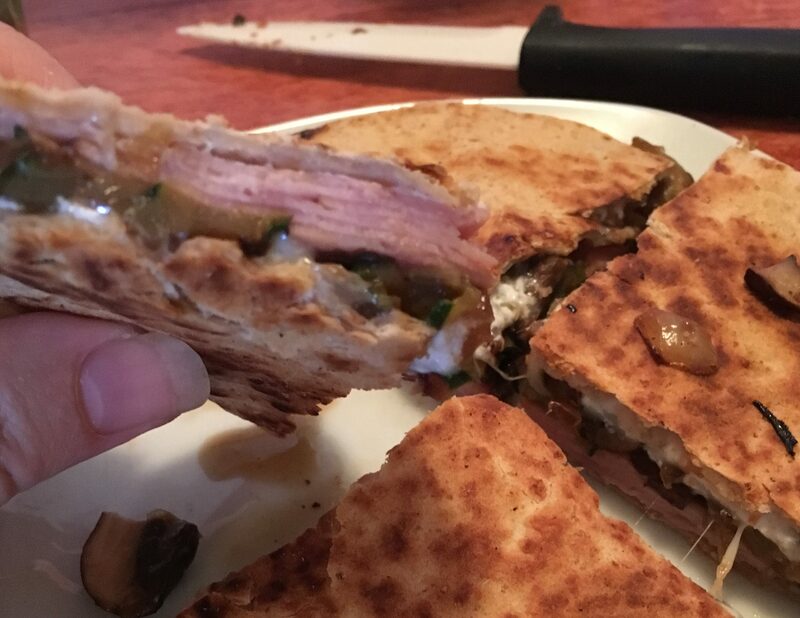 But I have to say that this quesadilla is still delicious! Today I used onion, mushroom, and zucchini for my veggies. You can use whatever you like. I am also trying to keep cruciferous veggies limited because cabbage seems to cause me to stall, so I’m not indulging in them as freely as I have in the past. 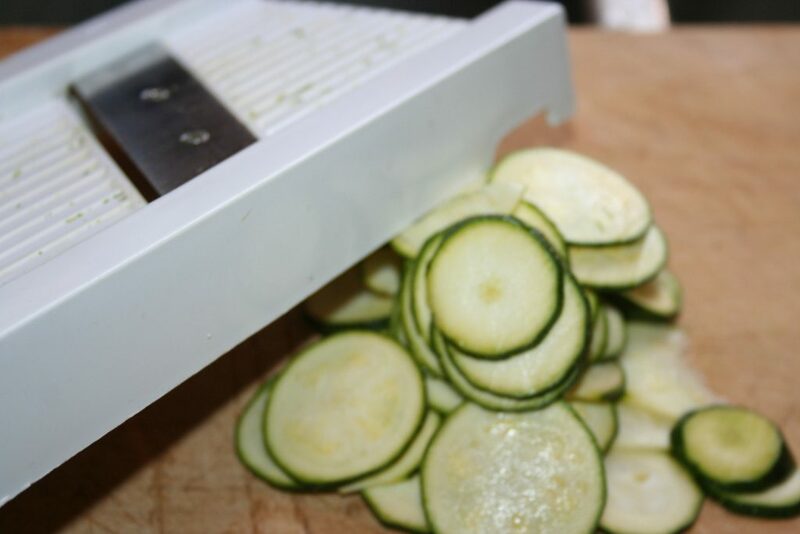 So, I start by slicing my zucchini nice and thin. 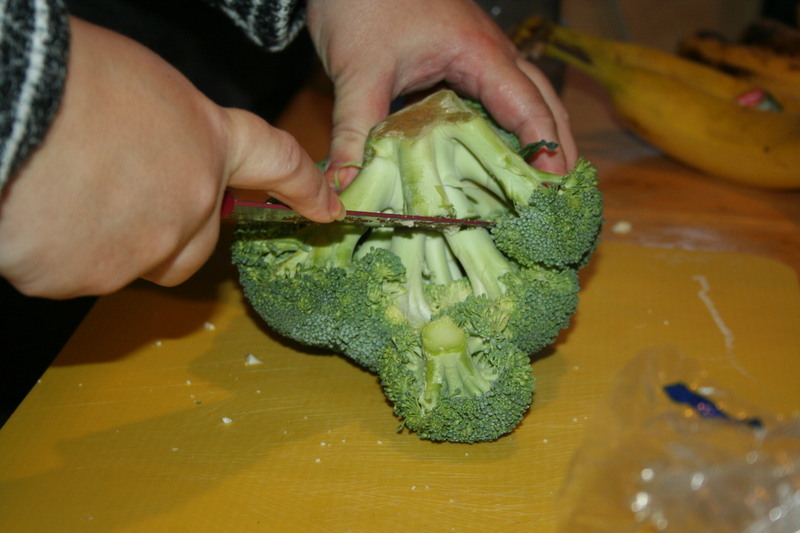 I use a mandolin for this job; it’s easy and I can do the job quickly. Place all in a heated skillet with a bit of oil melted in it. Add a bit of salt and pepper, as desired. 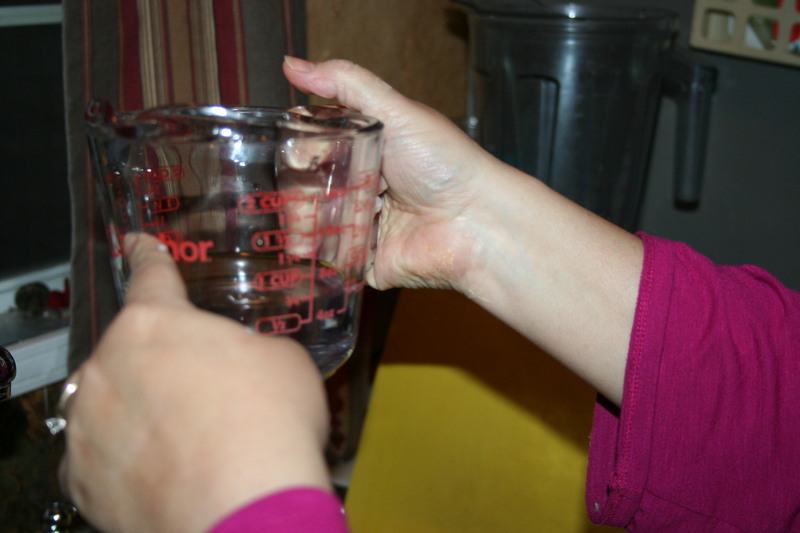 Salt helps them cook quicker because it helps remove the water from the veggies. 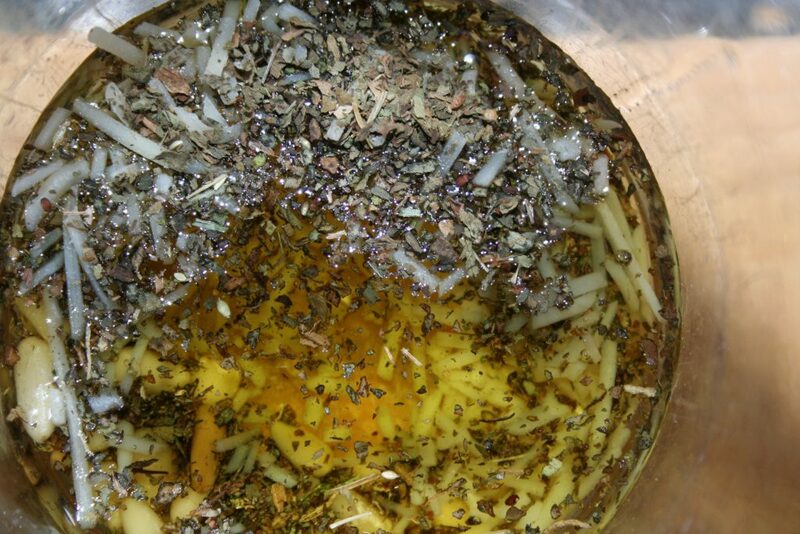 Sprinkle with a bit of oregano or your favorite herb. Meanwhile, I prep my tortillas. 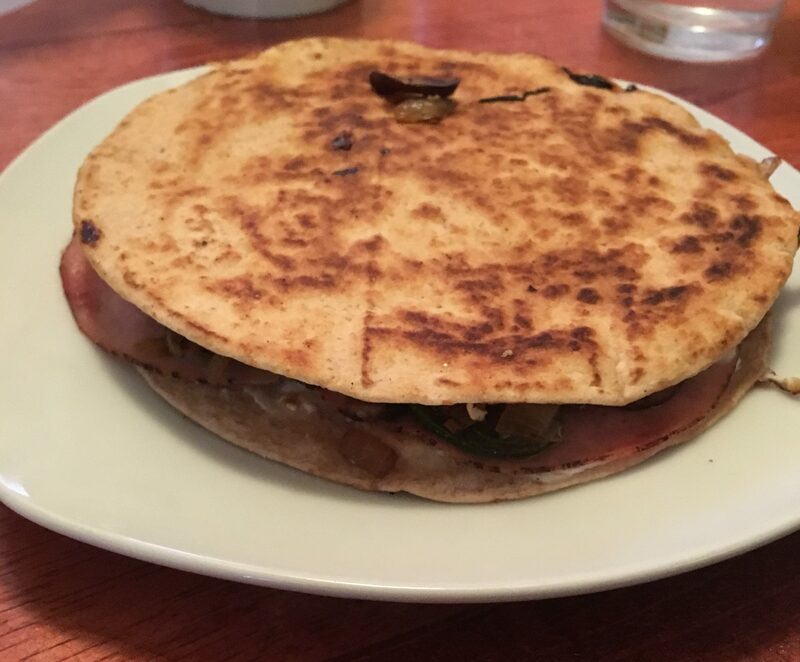 I prefer to use a Joseph’s pita and separate it into two very thin circles by cutting around the edge by snipping a hole in the edge, sliding my kitchen scissors into the cup, and cut around the circle. 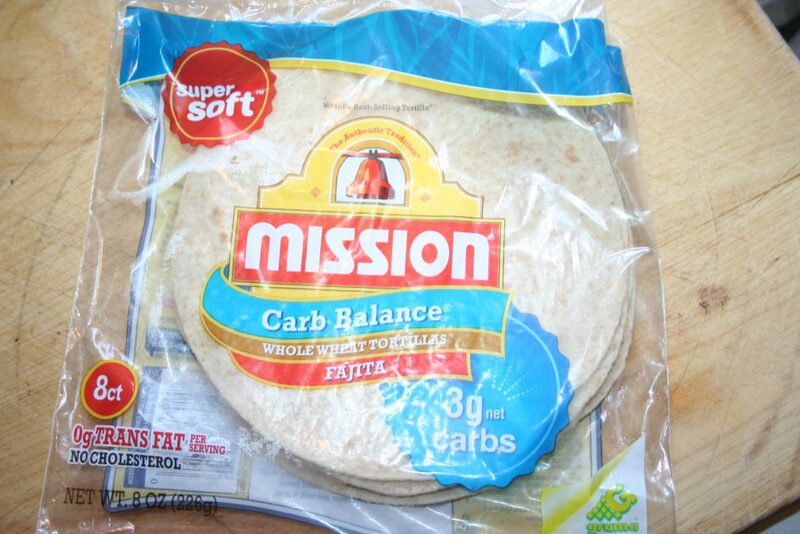 But my store was out of them and the lavash, so I resorted to Low Carb Mission whole wheat tortillas. I got the small ones that are 3g net carbs each so that I could use 2 of them. 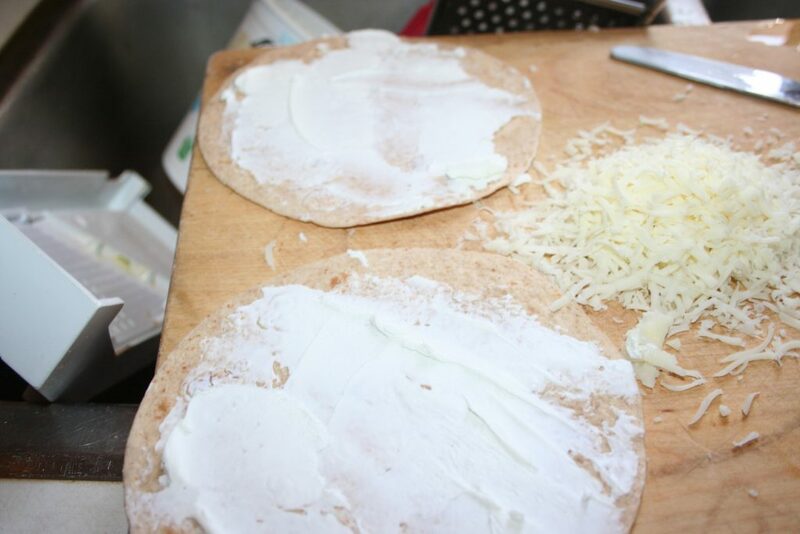 Spread half a wedge of Laughing Cow Cheddar Cheese or homemade greek cream cheese on each tortilla. We shredded a little over an ounce of part skim mozzarella cheese on a medium-small grate, so it makes a bigger pile of cheese and it will melt more quickly. 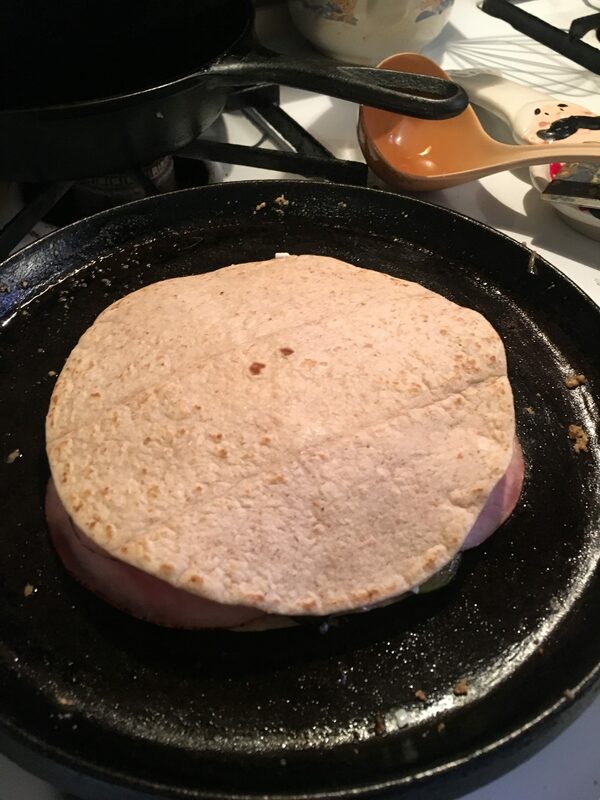 We are trying to lose some weight, so we are being aware of how much fat we us, so we simply sprayed the pan with a little coconut oil spray and then put one of the tortillas on the pan. Add the warm cooked veggies. 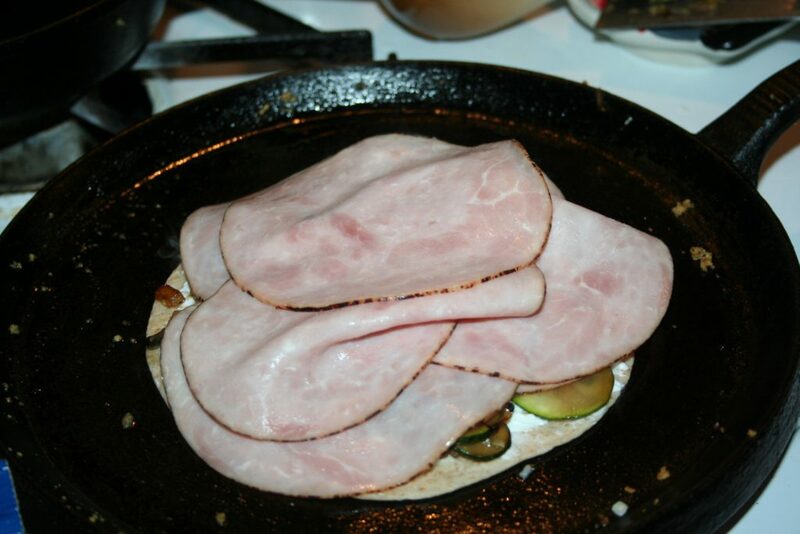 I wasn’t sure how much protein was here, and I was hungry, so I added a serving of ham. But you could just heap on more veggies and have a protein drink with it, if you are on Trim Healthy Mama where all our meals are anchored with protein. 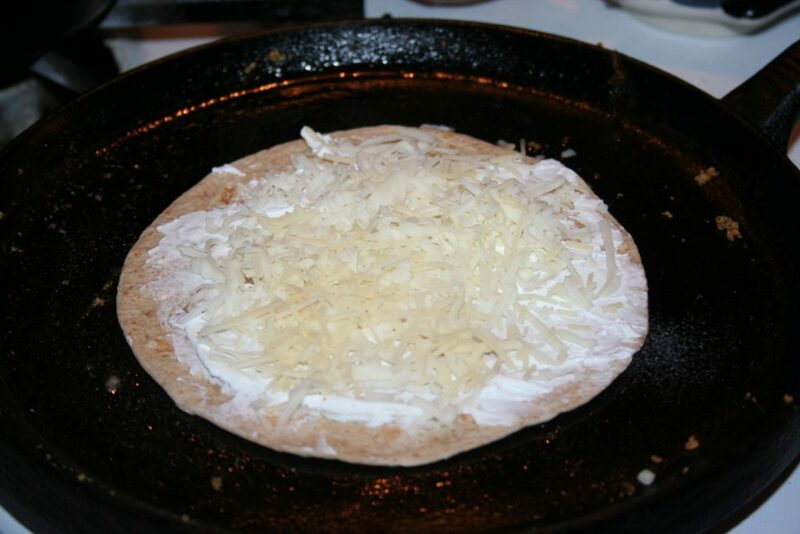 Place the other tortilla on top with cheese side down. 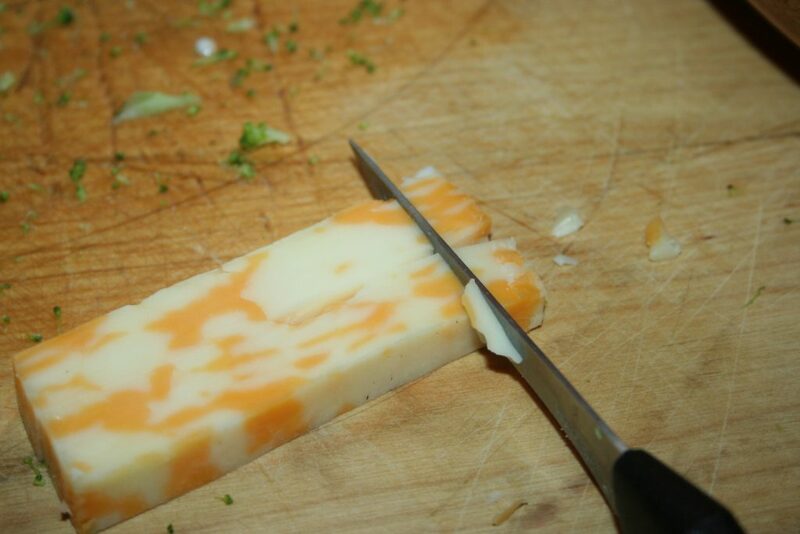 I cover it so that the cheese melts quicker. 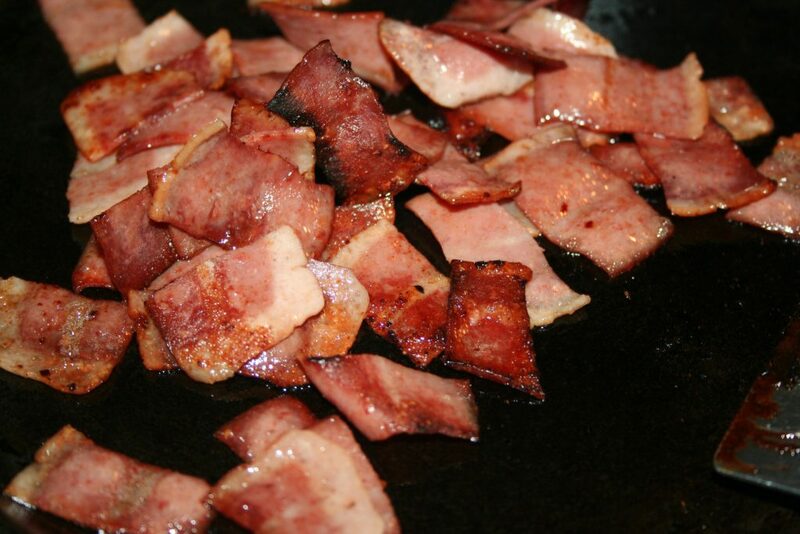 Flip when bottom is browned, about 5-7 minutes, depending on the heat of your pan. Serve and cut once it is browned. Sauté veggies with salt, pepper, and oregano. 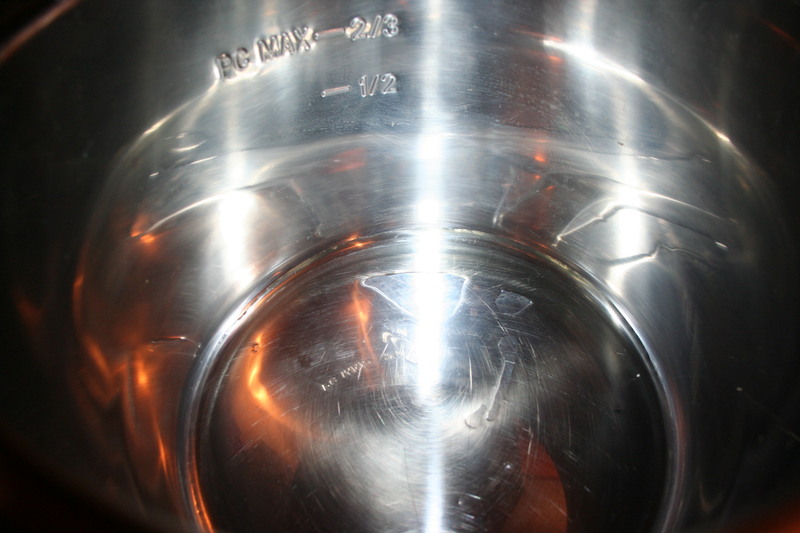 Spray pan with oil and heat. 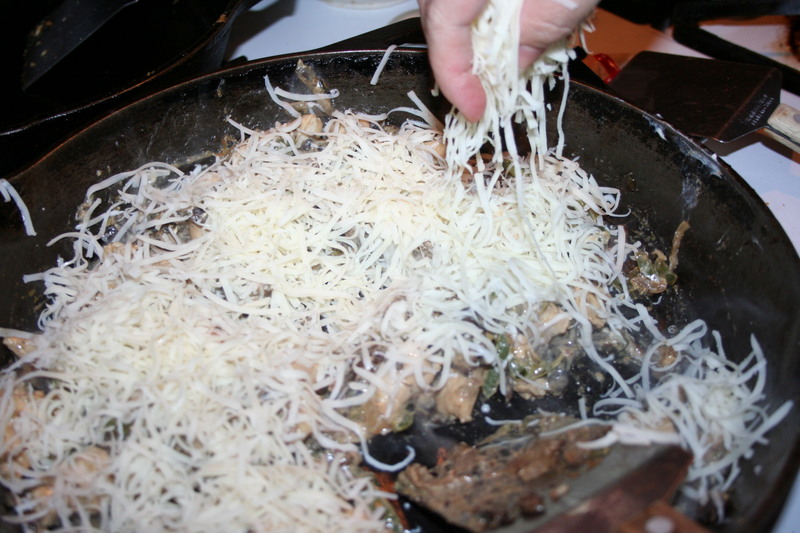 Add tortilla, cheese side up, then top with veggies and optional lunch meat. Top with other tortilla, cheese side down. Cover and cook, flip when browned on bottom. All the cheesy deliciousness of the full carb version sandwich. One meal I really enjoyed before Trim Healthy Mama and keto was Sausage Sandwich which is a creamy, cheesy sausage meat filling on sub roll. The picture I have here is not a very good one so I will try to get another next time I make this and upload it. 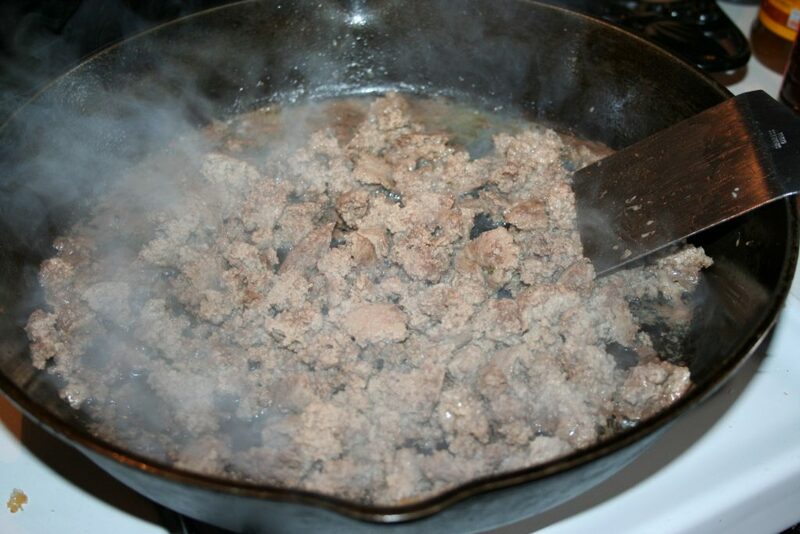 I used turkey sausage this time but you can use any kind of bulk sausage you like. I’ve done it with both pork and turkey. I cook my veggies in a separate pan because of picky eaters. 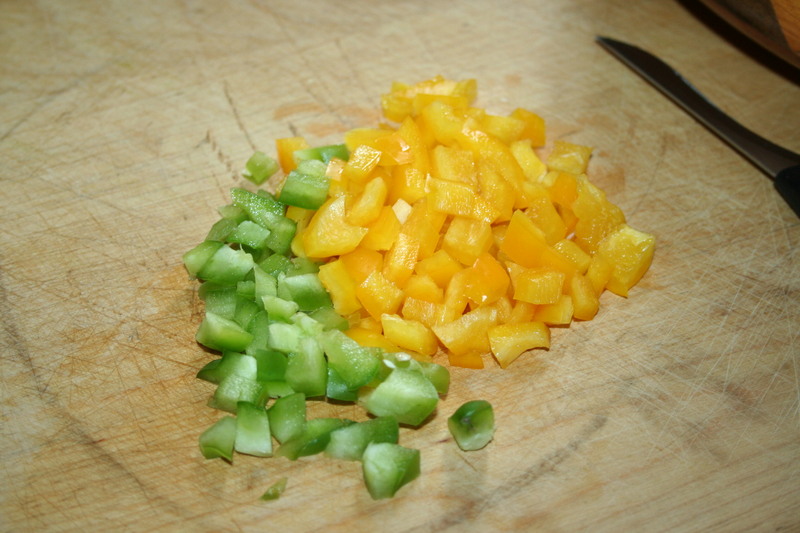 So I just used 1/2 and onion, about 1/3 green bell pepper, and about 4 ounces of mushrooms, all diced. I cook them with a little bit of coconut oil. 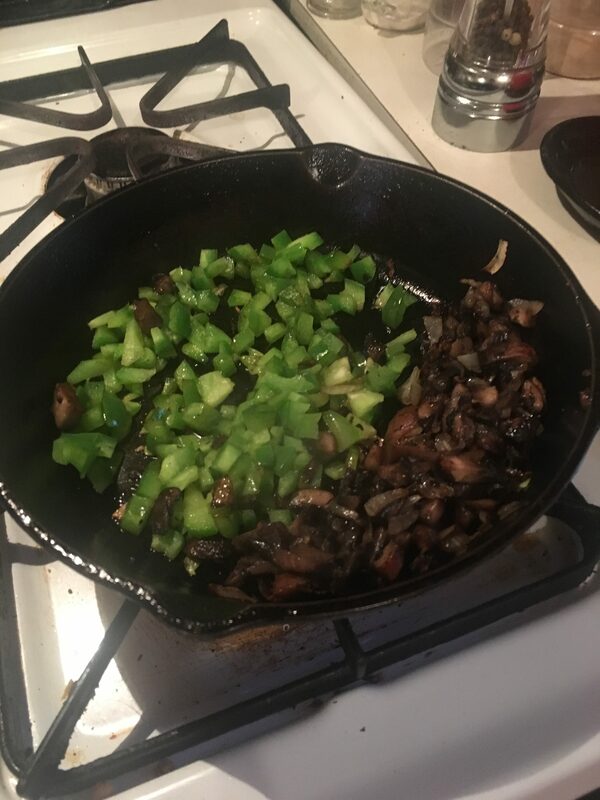 I started with the onions and mushrooms and had completely forgotten the green bell peppers, so I just pushed them to the side and added the peppers in. Saute until desired doneness. Unfortunately, I forgot to get pictures after this point. But when the sausage is browned, add the cream cheese and spices. 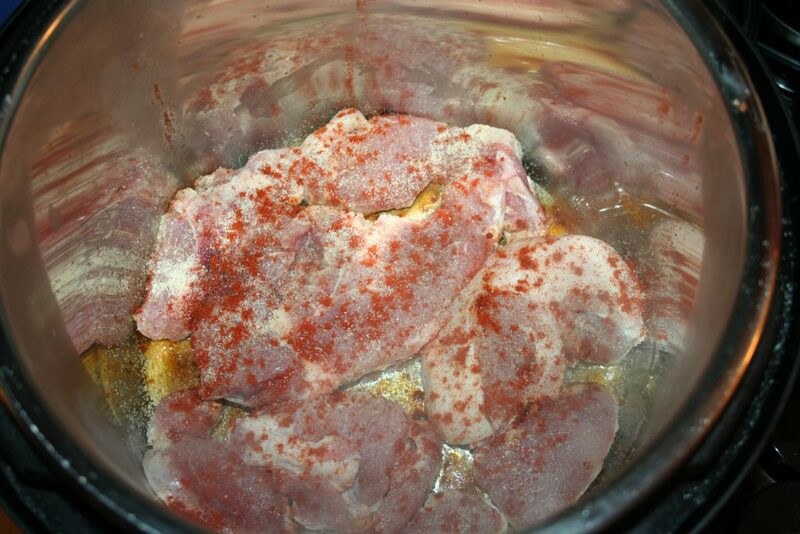 I add onion powder, garlic powder, salt, and pepper to season the meat up for those picky eaters. Also add in the Parmesan cheese. I decided to use THM 15 minute focaccia bread in my largest glass baking dish. Next time I’ll make it in a cookie sheet, making it thinner. 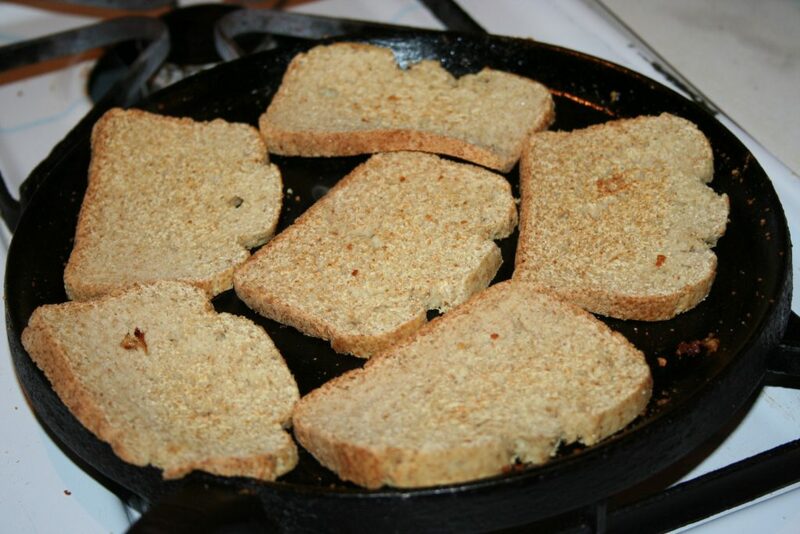 Spread the meat mixture on top of the bread. 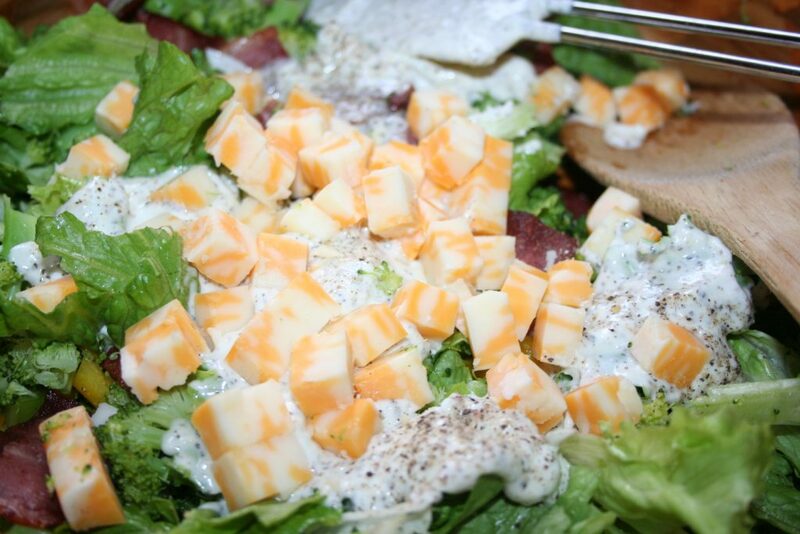 Then top with cheese; I used mild cheddar this time but have used colby jack or mozzarella cheeses before enjoyably. Put in the oven and melt the cheese. I prefer this as an open-face sandwich but you could just put the sausage filling on half of the bread and put the other half of the bread on top. Brown the sausage and drain the fat. 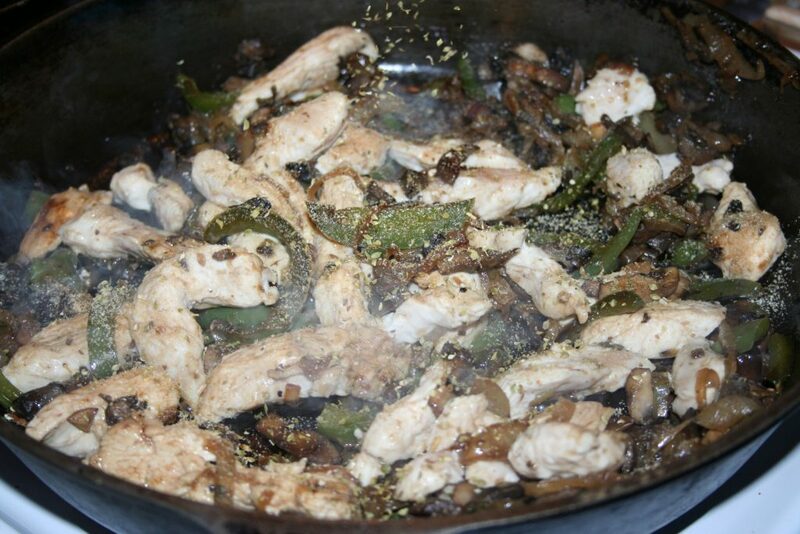 Either saute the onions, peppers, and mushrooms in with the sausage or in a separate pan. 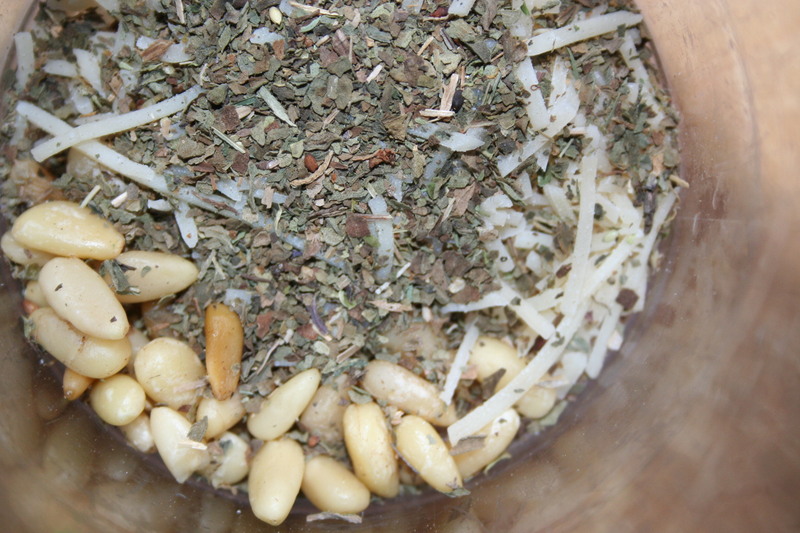 If not using the veggies or sauteing separately, add about 4 or 5 shakes of onion powder, about 2 or 3 shakes of garlic powder, and oregano to the meat and stir. 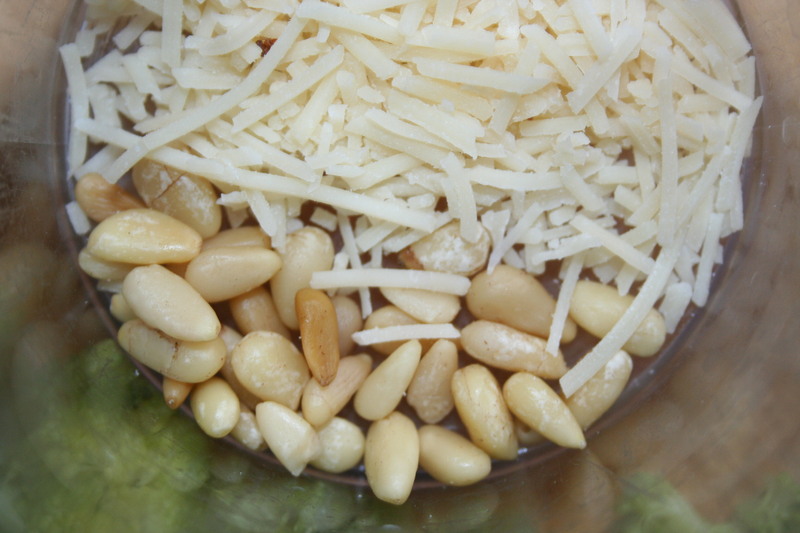 Now add in the cream cheese and shredded Parmesan cheese, melt and stir until combined. Then place 1/2 of your bread on the foil lined baking sheet.If you prefer your crust crisper, just put it on the cookie sheet. 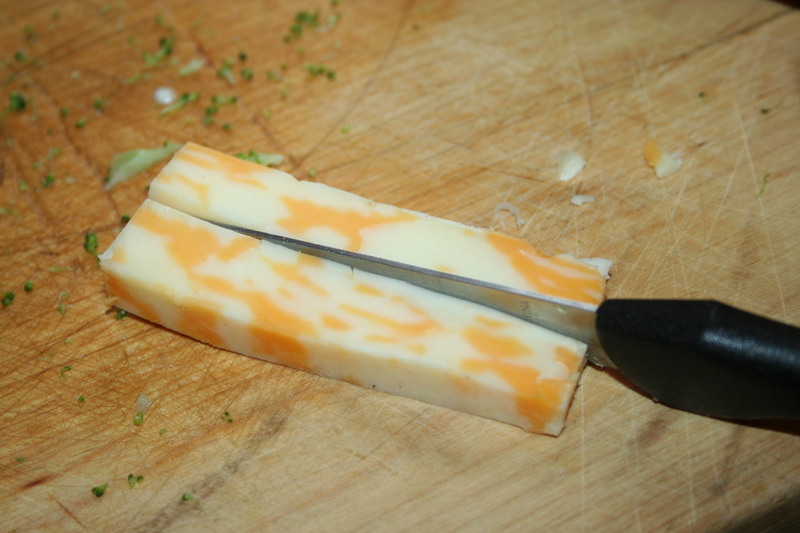 Sprinkle half the shredded cheese across the bread. Spread the cheesy meat filling on top of the cheese across the bottom of the loaf. Place the rest of the cheese on top of the sausage mixture. Place the remaining half of the focaccia on top of the meat and cheese. If using foil, wrap the foil up over the sandwich. Bake on 375º for about 15 minutes to melt the cheese. 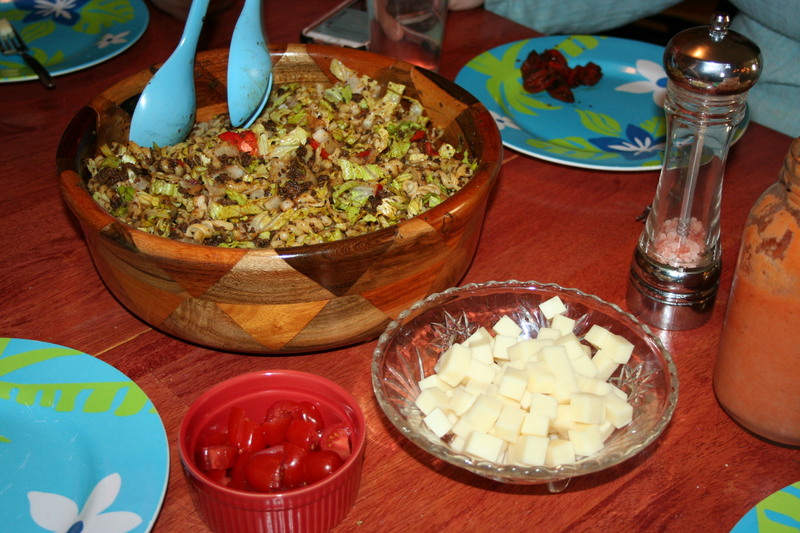 I hope you enjoy this recipe makeover.